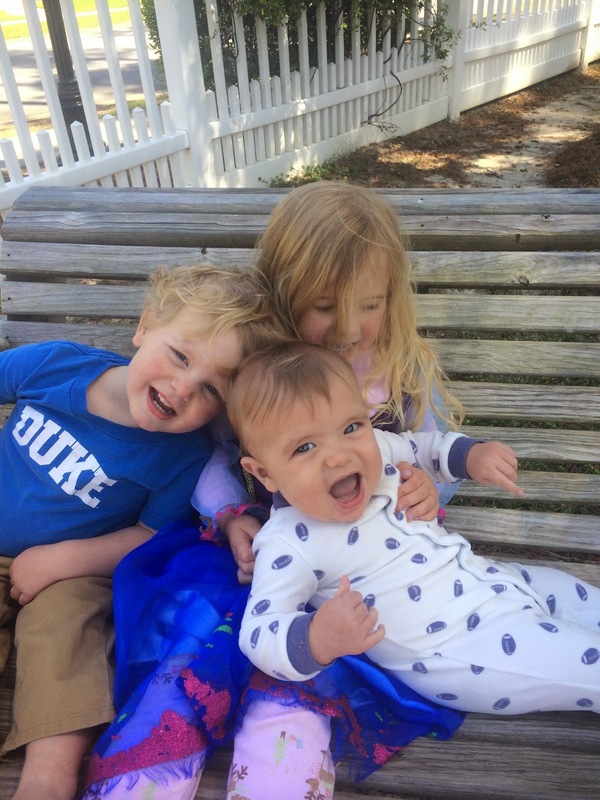 The life of CG, Cade, and Colt...told by their mommy. So I never make New Year's resolutions. I don't really have a good reason, just never decided to do it probably because I knew it wouldn't happen. Well, this year I thought I would give it a try. And what was my resolution? To post more on the blog. Well, it's the end of April and I haven't written even one post. Fail. I didn't do baby books. I don't do scrapbooks. I don't print pictures. I don't take enough videos. I don't make family yearbooks. One day I am going to look back at these years in my life and wonder what in the world I did, because I won't be able to remember. New resolution: update the blog with little thoughts here and there, not overwhelmingly long posts to play "catch up". There is no way I can even come close to covering what has happened in our lives since last April so I'm not even going to try. 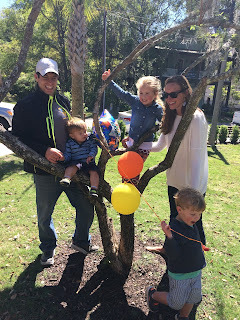 Instead, I'm starting now and hopefully I will have something to look back on one day and remember the fun and crazy days with three kiddos at home. 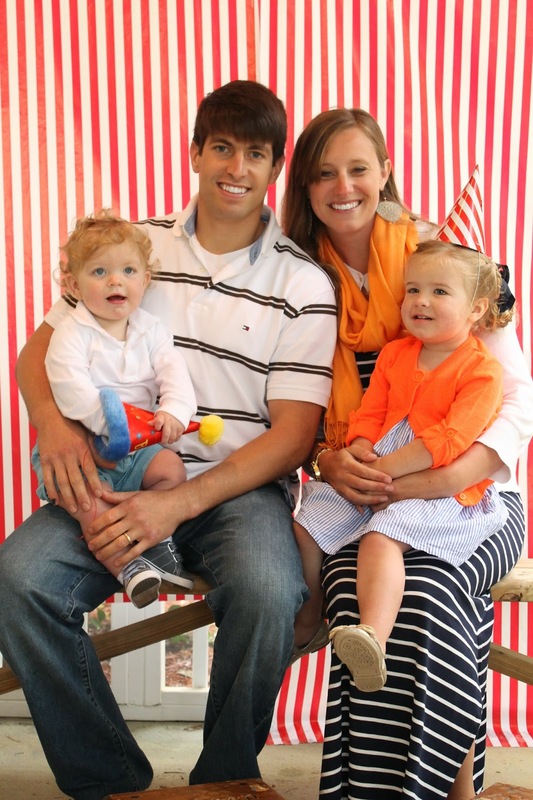 For the past three years, the kids and I have been a part of CBS (Community Bible Study). 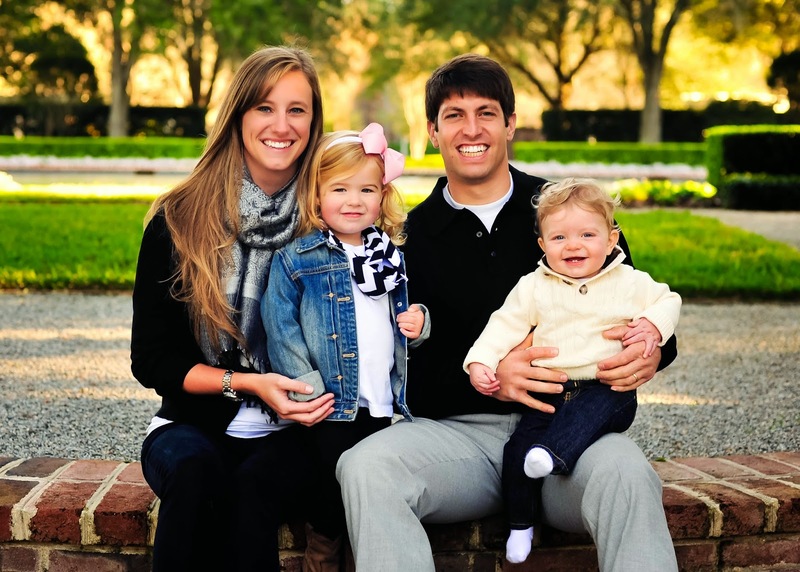 They have such an incredible kids program and all three kids have learned so much and have truly developed a love for the reading the Bible. 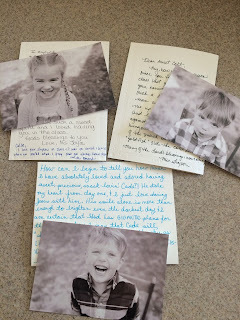 At the end of each year, Janet (of Silly Goose Photography) takes pictures and the teachers write a sweet note. So special! 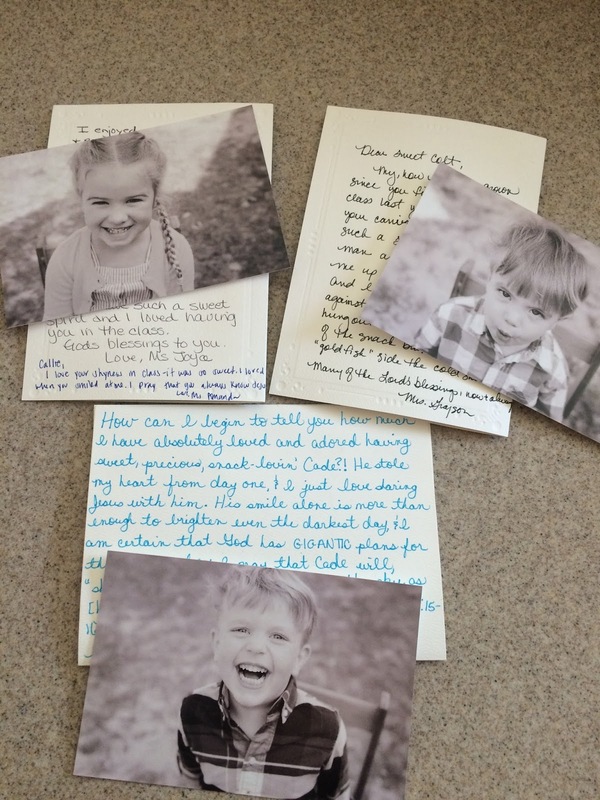 I am so grateful for each CBS teacher - for how they love my kids, teach them the Word, and have a blast doing it. 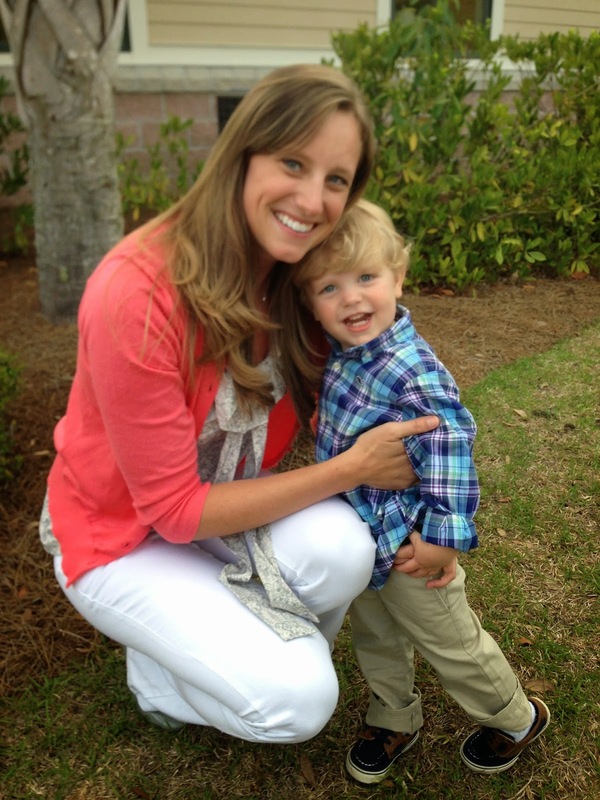 Janet taught Cade this year and she discovered a wonderful verse for his life I will now be praying over him. "...shine among them like stars in the sky as he holds firm to the Word of Life." So last week Lauren asked me, "remember that blog that you have that you used to write on?" Well, yes, I do remember. But when you have three kids 3 and under you don't really have time to sit around and write. Or think about what to write. Or find pictures to add. But today they are all napping and I had every intention to lay out. Of course, about 5 minutes after I came outside, so did the clouds. So here we go! This guy... My buddy... He keeps us all guessing! We decided last week that a day in my life is like a game of charades. I understand about half of what he says to me, so the rest of the time he is pointing and acting things out and I am trying to guess what he is telling me. Sometimes I am successful and sometimes he gets frustrated with me. But somehow we make it through the day! 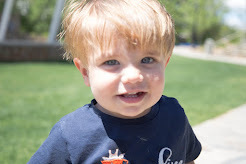 And then he smiles at me, gives me a giant hug and kisses, and wants me to snuggle with him at night time and I forget that we have been playing charades all day. Cade is all boy. He wants to play outside with no shoes on, dig in the dirt, and pick up bugs. Today he brought me a dead roach from the garage and I almost had a heart attack. And he laughed. He has the best laugh! He also is in love with his older sister and baby brother. He follows Callie around all day and just wants to play with her and be doing whatever she is doing. And when Callie is busy with something else, he comes to play with Colt. I love that Cade will lay down on his stomach on the floor to get in Colt's face and make him smile. Cade is always taking care of Colt - he brings him his nuk, tells me when he is crying, tries to help feed him. And my favorite, when Colt takes his nap, Cade always says "shh" to let me know I need to be quiet. And then he takes off around the corner running and yelling to find the drums. And now Colt... what has he been up to the past few months? Growing way too fast! I am trying to enjoy all the snuggles I can in case he is my last little munchkin. 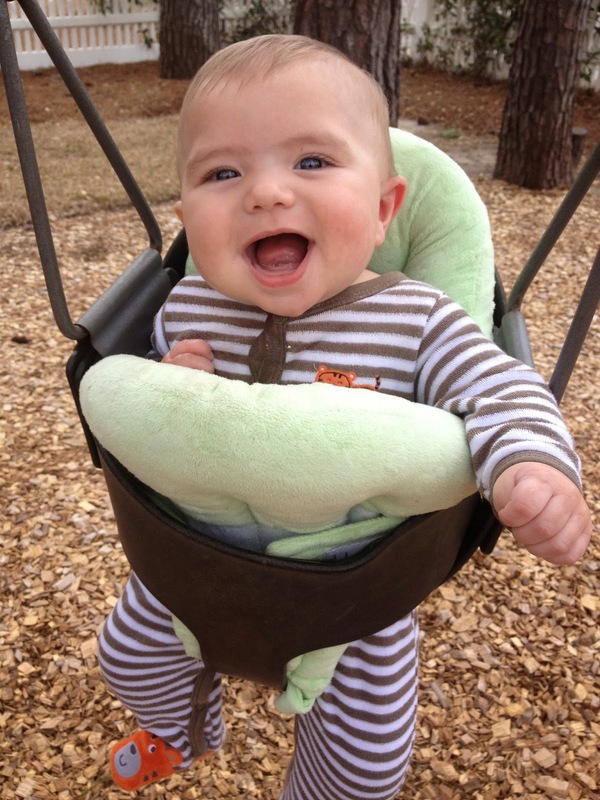 He was sick so much through the winter, but always a happy baby! 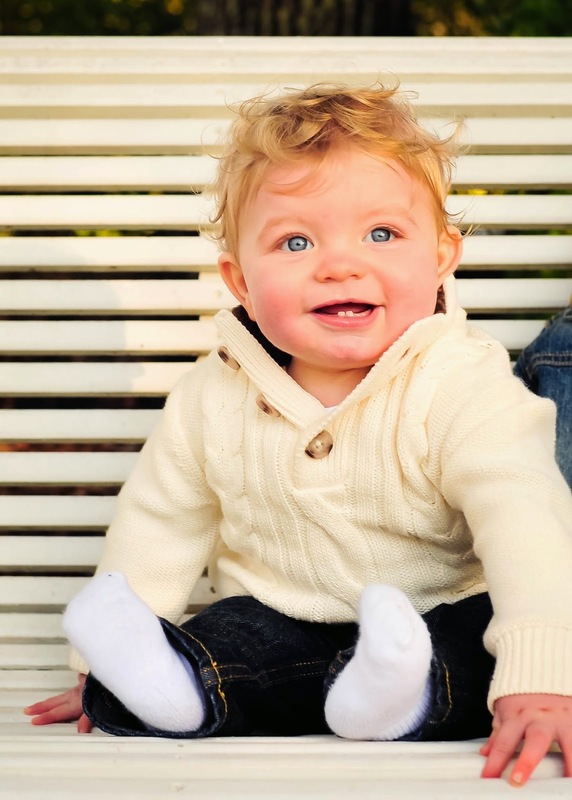 He is so smiley and loves to watch Callie and Cade play. He has had a really hard time sleeping through the night - which is hard for me! 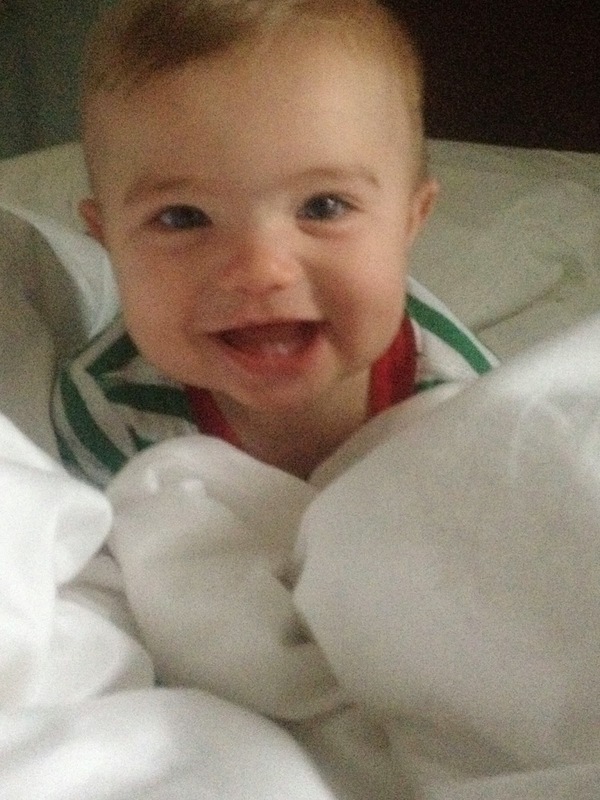 At seven months now, he is still waking up around 5 or 6. Thankfully he will just talk/cry for a few minutes and then go back to sleep until 7 or 7:30. Some nights he will sleep better through the night but by 6:30 he is wide awake and ready to play. Which to me is still the middle of the night! But we do have some fun times together in my bed while the other two are sleeping. 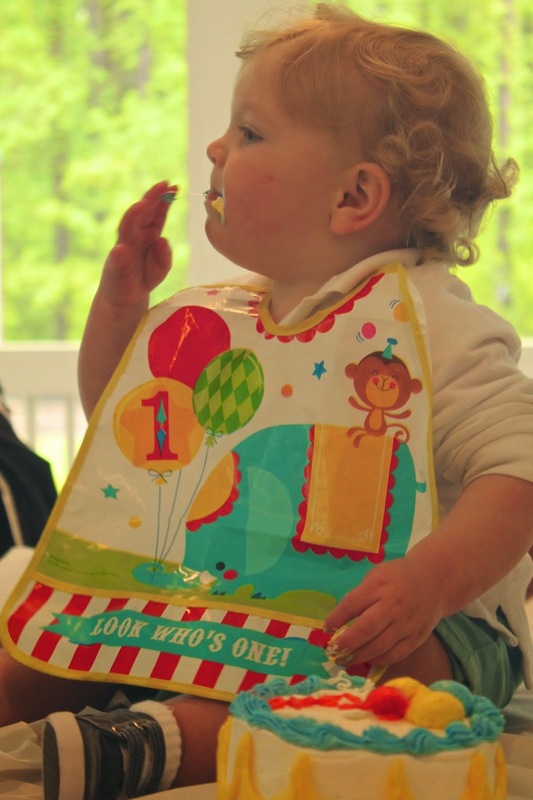 He has started eating solid foods and loves it! He eats oatmeal, applesauce, bananas, green beans, peas, yellow squash, butternut squash, carrots, sweet potatoes, spinach, and broccoli. Whether I am ready for it or not, Colt is very close to crawling. He can get up on all fours by himself and thankfully for now he just falls back down. Once he is on the move my life is going to be even crazier! 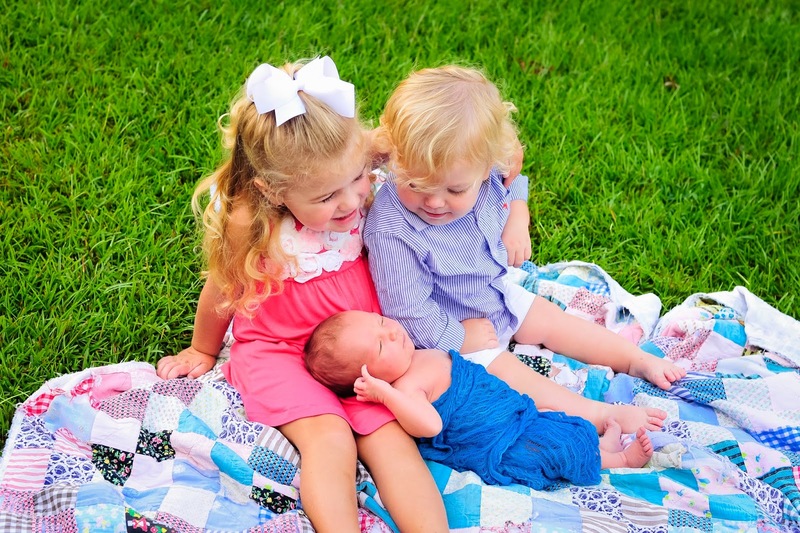 Colt has followed in his brother and sister's footsteps and loves to be outside. He loves to sit at the table on the back porch and watch them play, jump in his octopus, or relax in the swing. We took all of them to the beach for the first time this year (and Colt's first trip ever). They were so happy running around and Callie actually got in the ocean! It was freezing but she was so happy! And Colt was content to sit on his towel and eat his shovel. 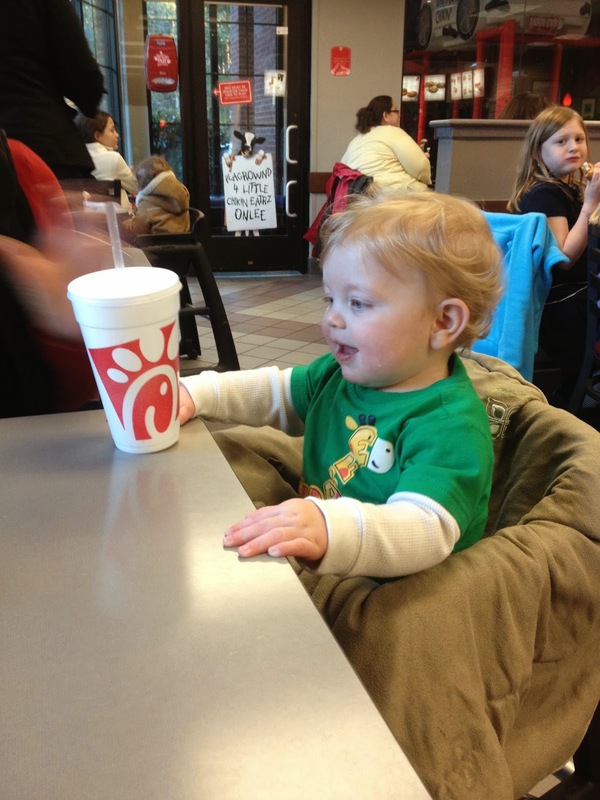 Speaking of eating, Cade still loves to eat. All. The. Time. As soon as he gets up from a nap or in the morning, or a soon as he finishes a meal, he goes straight to the pantry for a "na", which I have successfully interpreted to mean "snack." All three of my children have a love for sugar just like me. 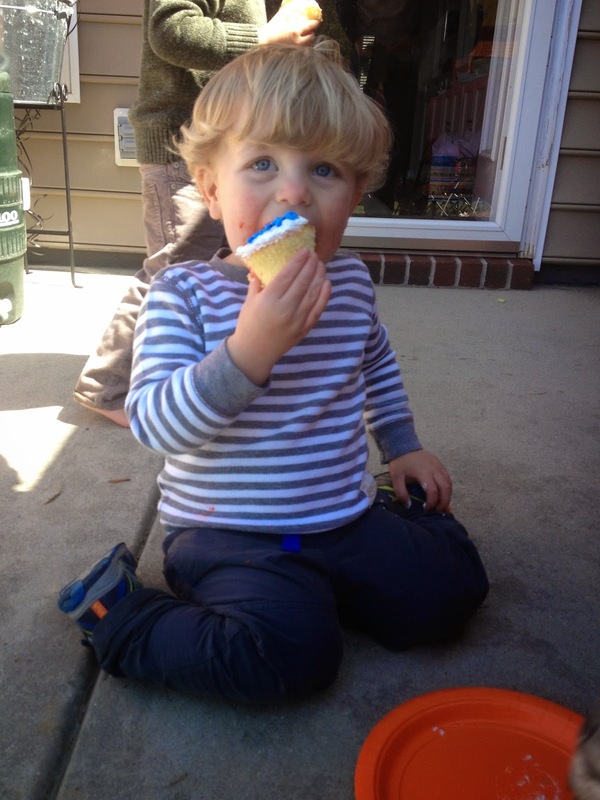 As soon as Cade finished this cupcake he tried to steal another. Haha! Back to a love for being outside... I am so glad we bought a swing set a few years ago! It has provided hours of swinging entertainment and passes the time in the afternoon while we are waiting for Daddy to get home. Yes, I know that Cade has no pants on in that picture. This was potty training time! Cade is successfully and completely potty trained. What?! It was all him. I was not ready to try it, but he insisted. After about two weeks of holding it all the time, he went in the potty a few times and it clicked. He has only had a handful of accidents in the past 3 months. I am so proud of him! 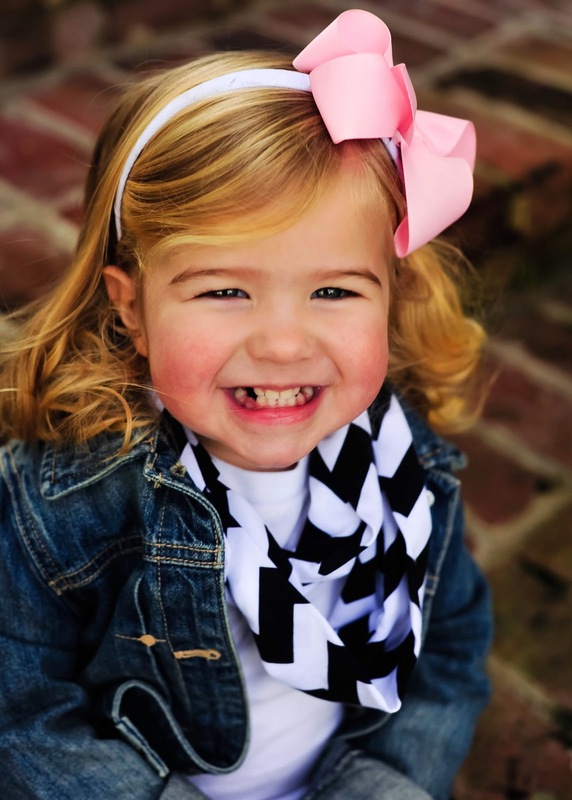 And big sister Callie is growing up too fast also! Before I know it she is going to be a teenager. She loves to dress herself - and most days it is a princess dress or a twirly dress. 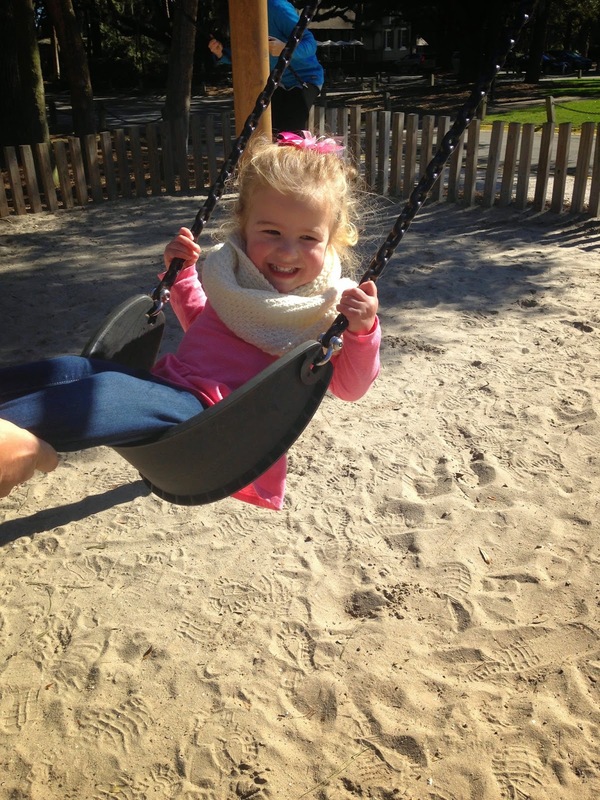 Shoes are a favorite - she even tried to wear her Minnie Mouse heels to the park last week. Also, accessories are a must: umbrellas, scarves, necklaces, babies... she always has something to carry with her. And yes, with all the swinging that goes on, Callie is still the queen. I promise she could beat anyone's record of time spent in a swing. I love to listen to Callie sing and she is constantly making up songs. 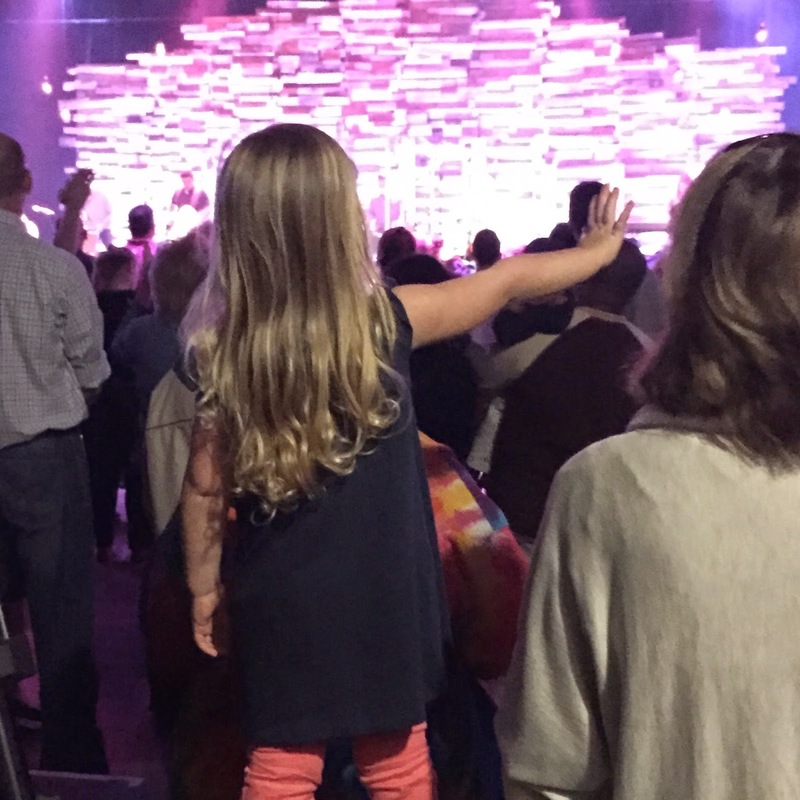 We took her into the service when we had a night of worship at LCC and it was so amazing to see her worship the Lord. She has such a sensitive heart to the Lord and I can't wait to see what He is going to do with her life. 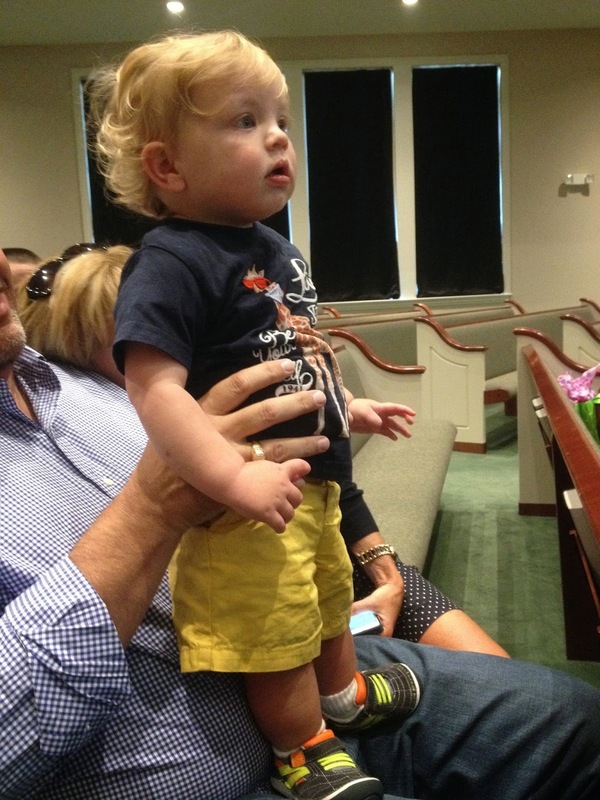 Future worship leader! All in all, yes life is crazy. But wonderful. And I love it. My pregnancy with Colt was very similar to being pregnant with Cade. Every person in the family was predicting that we would have another boy. 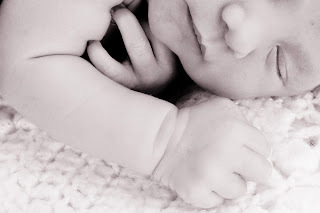 I had no problems during my pregnancy, just very uncomfortable and had a hard time sleeping - especially near the end. I felt like the baby was huge and I could never get comfortable. I gained the most weight with Colt, but it was all in my belly, thankfully! I went to my 36 week appointment not expecting anything, but Dr. Edwards let me know that I was already dilating and Colt was getting ready to come so I needed to take it easy. Bryan had to go to Athens Friday through Sunday for a wedding, so Aunt LaLa made the trip home to take care of Callie and Cade. And it was a good thing she came! She was a huge help and did everything with the kids so I could rest. 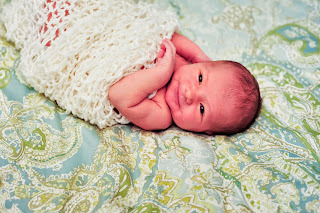 I obeyed and stayed in the bed or on the couch, but felt totally ok and didn't feel any contractions. I went to the doctor on Monday all proud of myself, only to find out that I was even more dilated and Dr. Edwards was convinced I was going to have the baby within a few days. I was very conflicted because I did not feel like I was in labor at all! He told me to go home, get Bryan and all of our stuff and come back Tuesday morning. Driving to Savannah on Tuesday morning, I was not ready to have a baby. 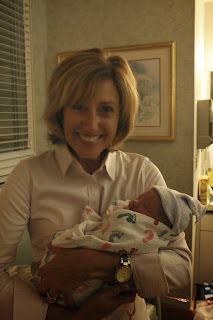 I did not feel like I was progressing at all or even having contractions. But apparently I just didn't know what was happening. 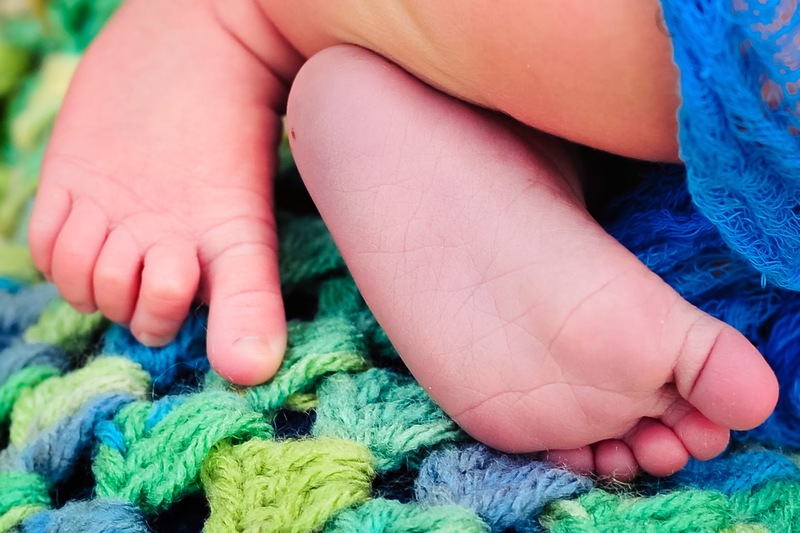 By the time I was ready to leave the office, I was almost 5 cm dilated and he told me I had to check in the hospital - the baby was coming whether I was ready or not. At only 36 weeks and 6 days, I thought it was too early! 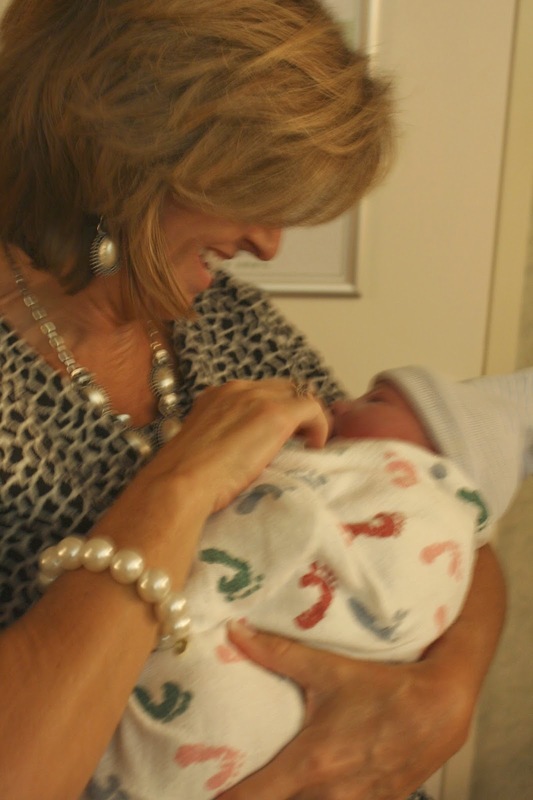 But God had a plan for Colt to be born on August 26 and so that is what happened. We called all of the family and everyone started to make their way to Bluffton. We got Bryan some food and checked in to the hospital around 12:30. I got an epidural and hooked up to all of the monitors. I was having consistent contractions but I couldn't feel them. We visited with everyone coming in to say hey, finally decided what to name our child(! ), and tried to get some rest. I had a really great epidural, but my left leg was falling asleep, so the nurse suggested I turn over on my side. Once I did that, it all starting happening fast! Apparently that encouraged Colt to drop even lower and it was time to start pushing. I had to kick LaLa and Emi out of the room and call the doctor. Colt must have been pressing on my bladder because I had major stomach pain with every contraction. Whoever told me that each labor gets easier lied to me! I think they have all been painful! 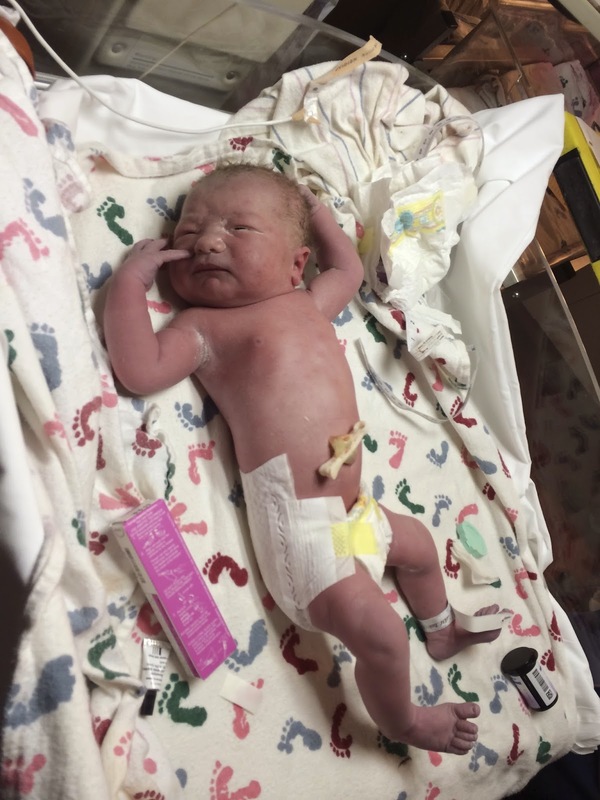 We made it through and after only 10-15 minutes of pushing, we had a beautiful baby boy. Since he was early, the special care nurses were present for delivery and they checked him out when he was born. Perfect baby boy! 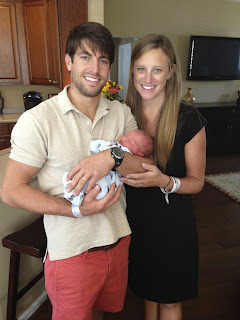 All of our family was able to come and meet the newest addition to the family. As the night went on, #coltbstrong became the perfect hashtag for our little one. 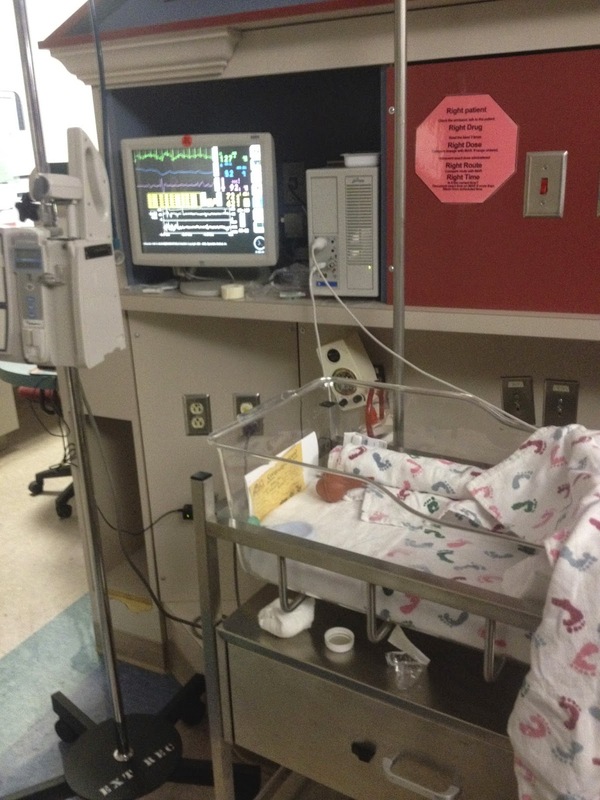 Because he was premature, the nurses had to check his blood sugar every few hours. 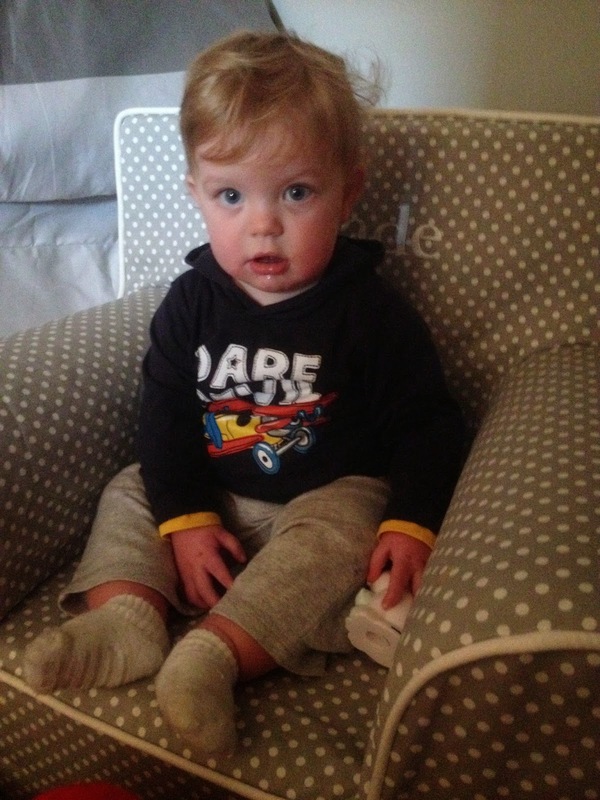 Very early on Wednesday morning, his blood sugar dropped and he had to be admitted to the special care nursery. Thankfully it came back up quickly and he did not have to be hooked up to tons of monitors (just a few). He did get his own little home in the nursery where he stayed until Friday morning. Seeing all of the other babies in the special care nursery, made me so grateful for our precious little one and how healthy he was… and still is! I was still admitted in the hospital downstairs, so we had to walk up and down, back and forth, every couple of hours. After I was discharged on Thursday, we were able to stay in the special care nursery with him for his last night. The nurses were wonderful, but they had to prick his heel every 3 hours, and it was so sad! His poor little feet did recover though, although PawPaw was worried for a few days that they were too blue and purple. Callie and Cade were finally able to meet their brother on Thursday morning. They had to walk through the special care nursery and I think it was a lot for Callie to take in! But they were so excited to see Colt. I was surprised with how interested Cade was in meeting his brother. 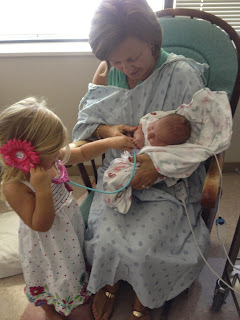 It was a short visit, but Callie did take time to teach Aunt Libby how to listen to his heartbeat. :) Maybe she will be the next (or first?) doctor in the family! Colt passed his hearing test, the carseat test, and multiple other tests that they gave him over those 3 days, and we were able to bring him home on Friday. 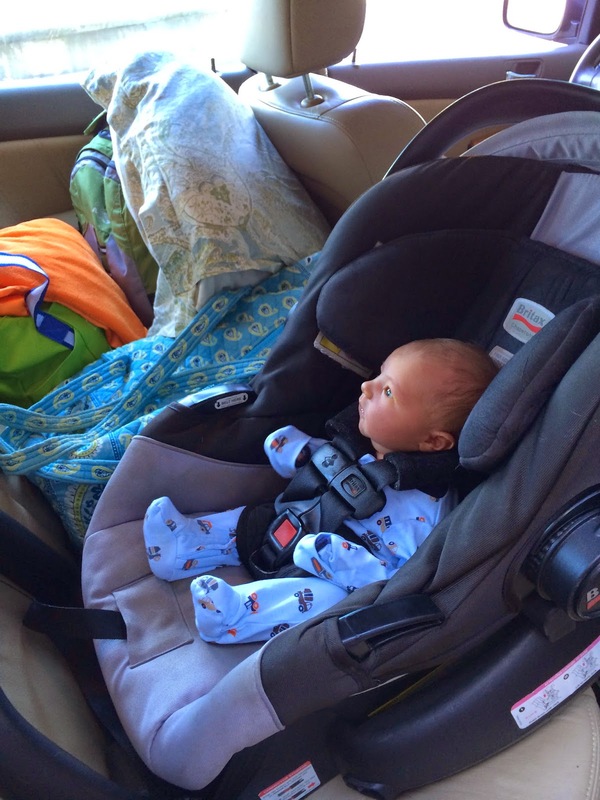 I always think they look so little in the carseat those first few days. 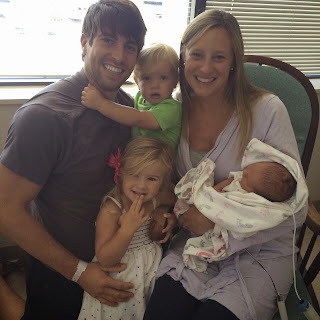 All of our family, Gigi, Big Daddy, Mama D, PawPaw, Mimi and Papa, and especially LaLa and Auntie Em, took such great care of Callie and Cade (and Bear) while we were in the hospital. It was a group effort and I don't know what we would have done without them! Lauren got to stay through the weekend and help out which was wonderful. Then the moms took turns staying with us - night feedings, load of laundry, dishes, cooking… they did it all! 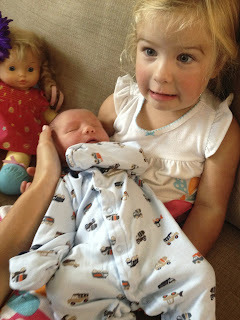 Callie loved having another baby in the house - but he is a little more fragile than the baby dolls! Cade wanted to play with him, and didn't understand why he couldn't play catch?! After that first night/day of low blood sugar, Colt has not had any more issues and we thank God for that! 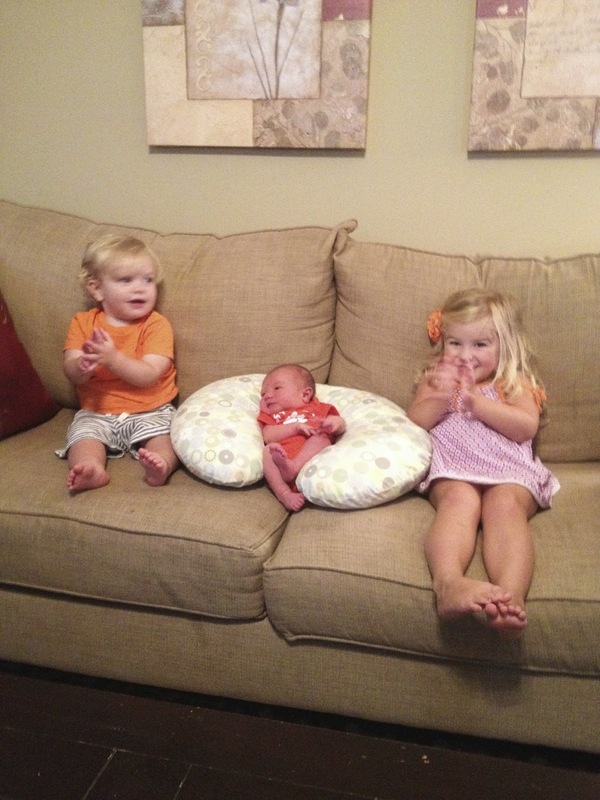 CG and Cademan were teaching him the Clemson cheer before he was even a week old. 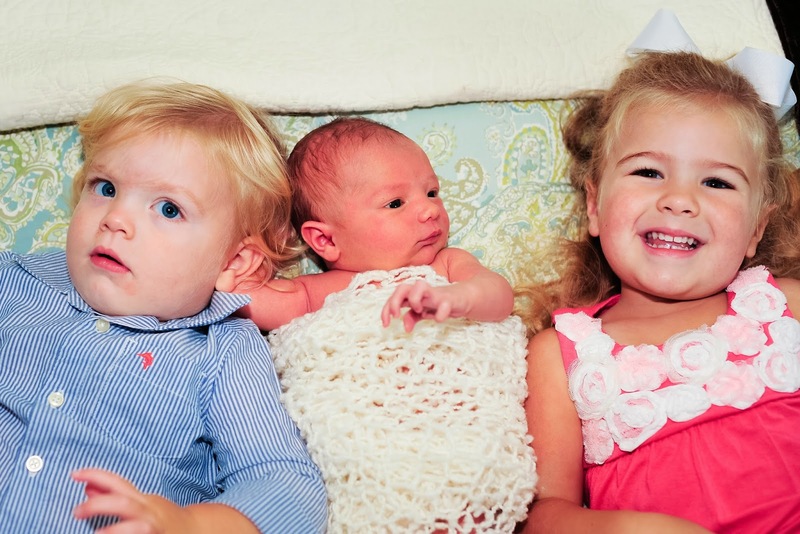 Bryan and I are so blessed with these three beautiful children! Welcome to the family, Colton! Is it June already? I realize that I have been a total slacker about updating this blog, and I am sorry. I would promise to do better in the future, but knowing what is coming up in the next few months, I probably shouldn't! So here are the important things that happened in the last 6 months that I never put on the blog. And thanks to my phone and photo stream, I do have a few pictures! 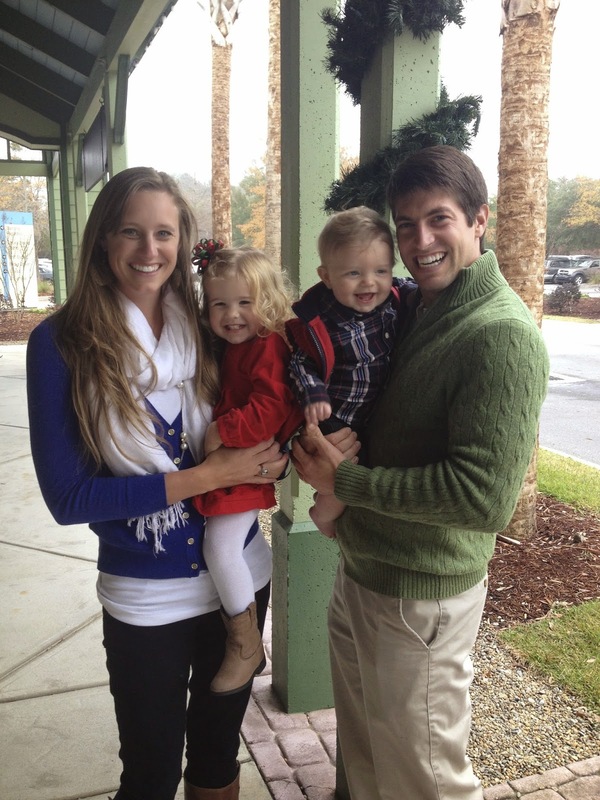 We took the kids to see Bluffton's longest-ever Christmas parade. 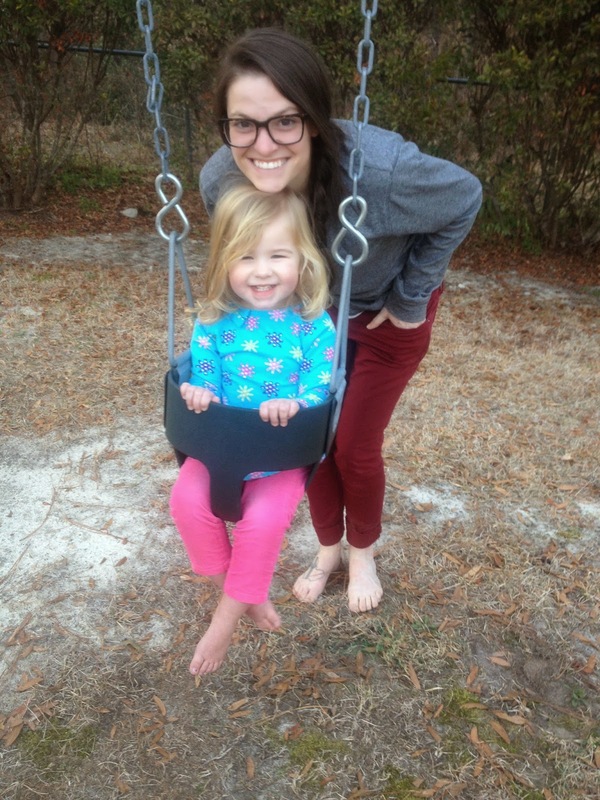 Only in South Carolina do you wear short sleeves and sweat in December. As you may remember, Callie had quite the traumatic visit to see Santa last year, so this year she wanted nothing to do with him. 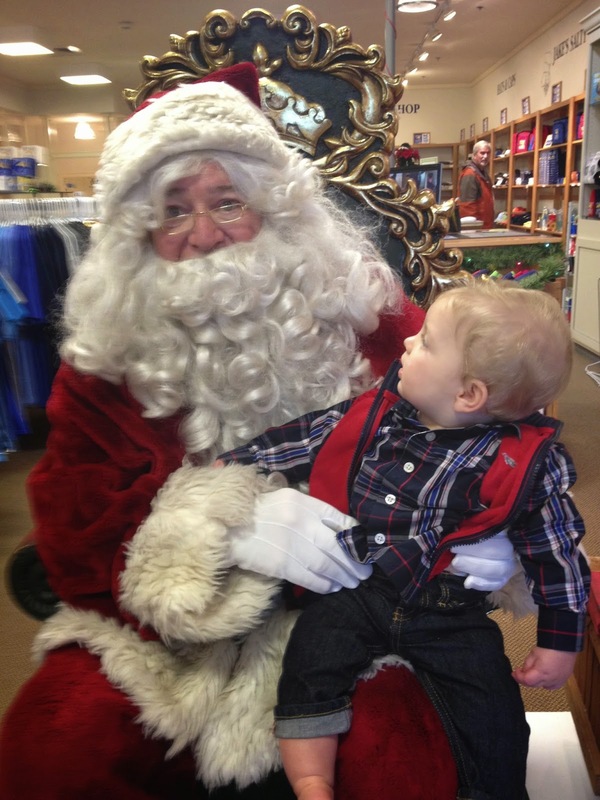 We did take Cade to see Santa and he was just confused… "Who is this guy?" Callie baked Christmas cookies with Mama D and Mama Gerry and loved making and playing with the dough. She is very serious about her cookies! Callie had her first Christmas program at school, and I can't tell you how many times we have heard the song, "Mary had a baby boy" sung at the top of her lungs. 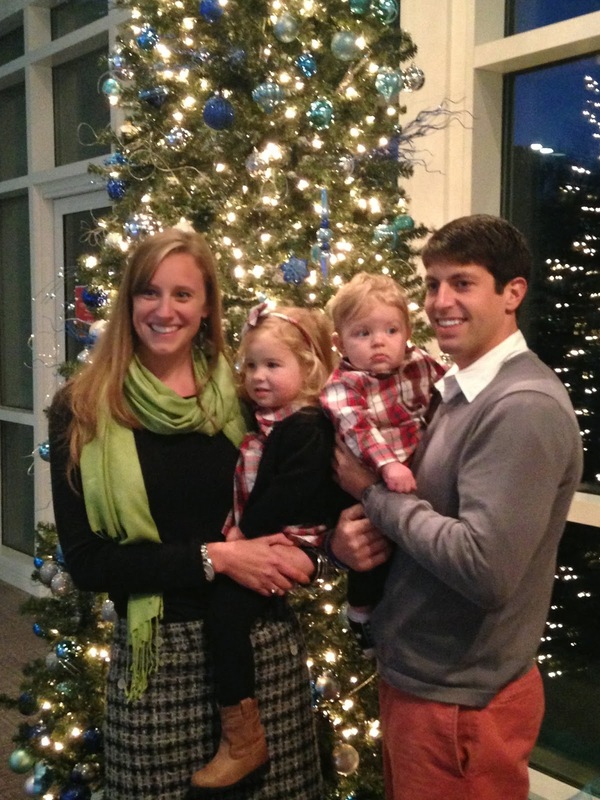 …and we took our annual family picture in front of the tree. 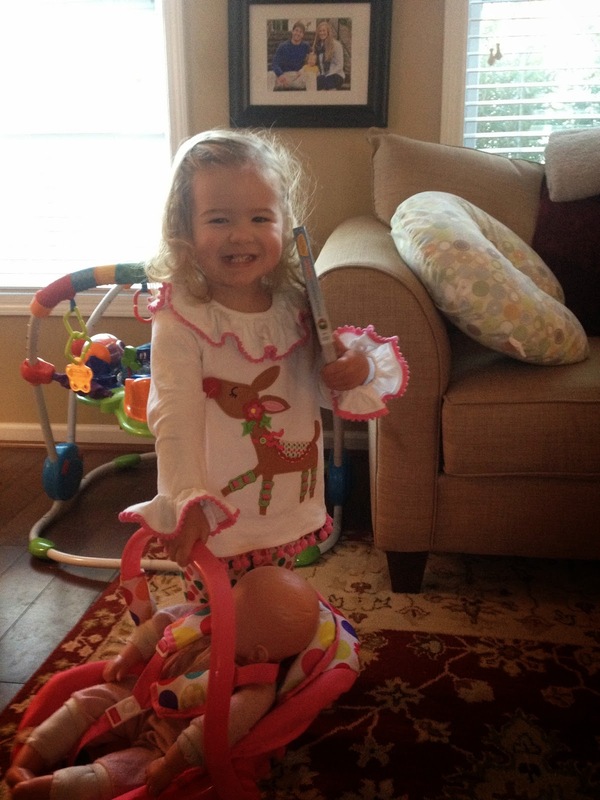 We celebrated Christmas morning at our house and it was so much fun! Callie understood the concept of presents and Cade was just happy to play with the wrapping paper and ribbons. 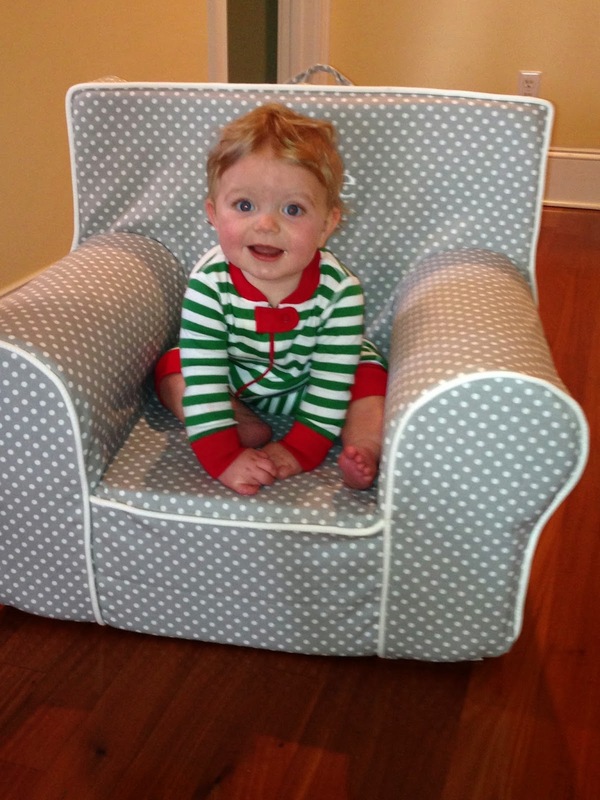 So Merry Christmas from the Cokers! 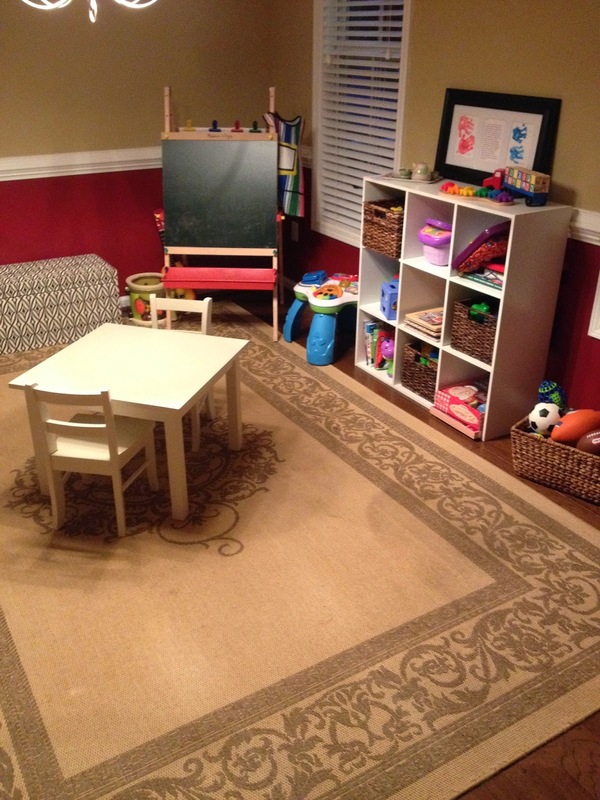 After Christmas, we decided to turn our dining room into a playroom. I was tired of the toys taking over my living room, and it was the best decision ever! 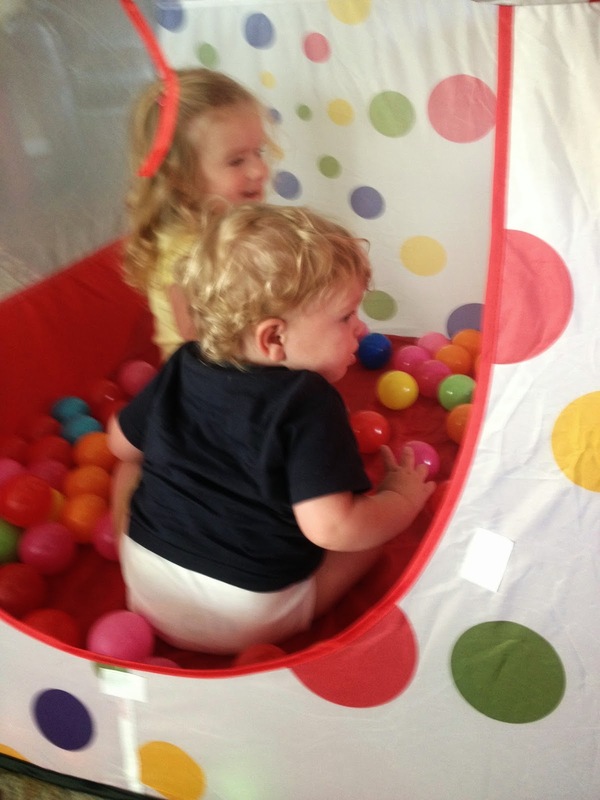 Callie and Cade both love to play in their playroom and they spend hours there each day. 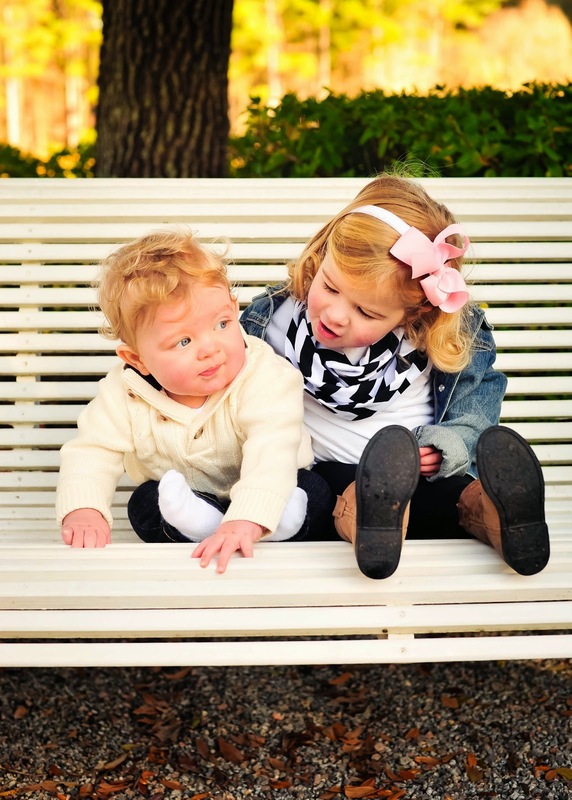 Janet Powell (Silly Goose Photography) took some great family photos that I love! It's A New Year! Hello 2014! Callie started ballet in January and she looks so sweet in her little pink leotard and skirt. We have spent countless hours circling the neighborhood in the wagon. 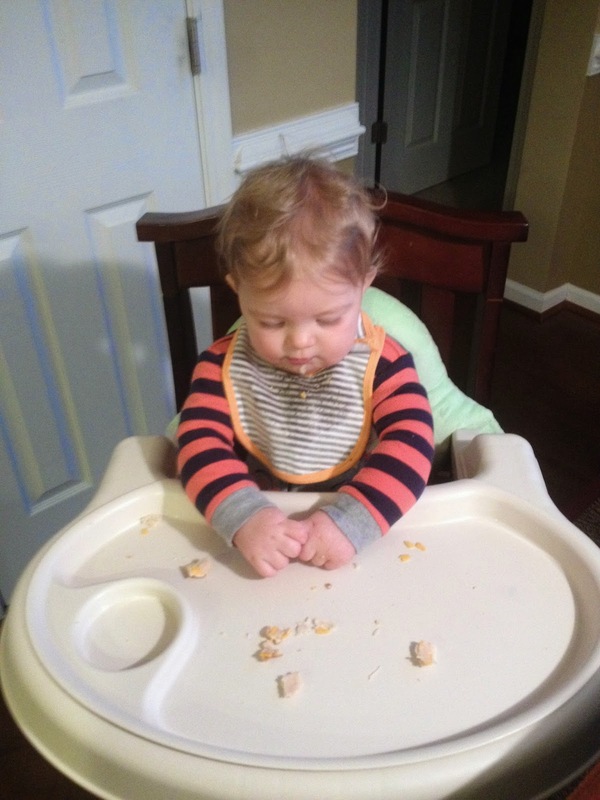 Cade started eating solid foods and has not stopped! I promise we go through at least 4 jars of puffs in one week. He is a big growing boy and eats so much! I don't even think he tastes his food - he just inhales it as fast as he can. Our grocery bill is already crazy; I can only imagine what it will be when he is a teenager! I may have to go back to work full time just to keep food in the house! Bryan and I were able to go to Passion again this year and Callie and Cade had a great time staying with Mama D and PawPaw. They got to go to the Children's Museum on the Island and no one wanted to leave when it was nap time. 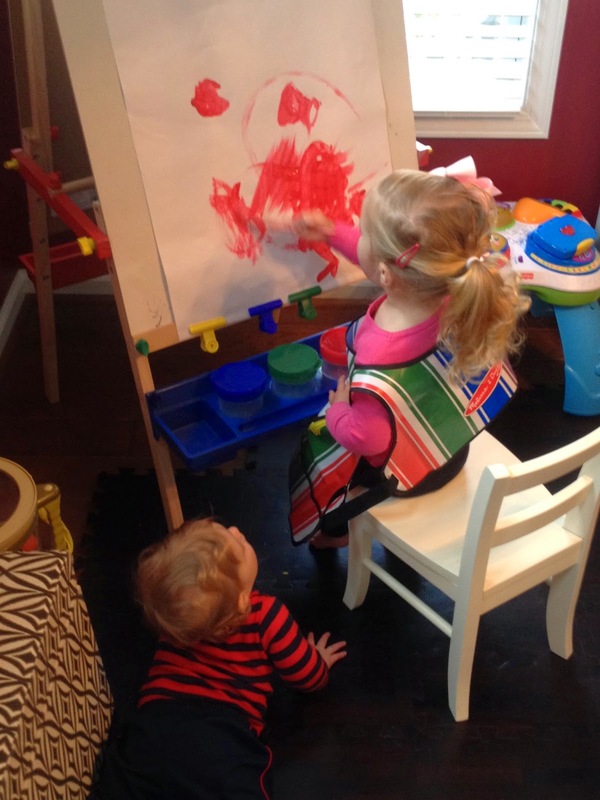 On the few cold and rainy days that we did have, Callie became an artist at her new easel. Isn't this a beautiful drawing? No More Party of Four! 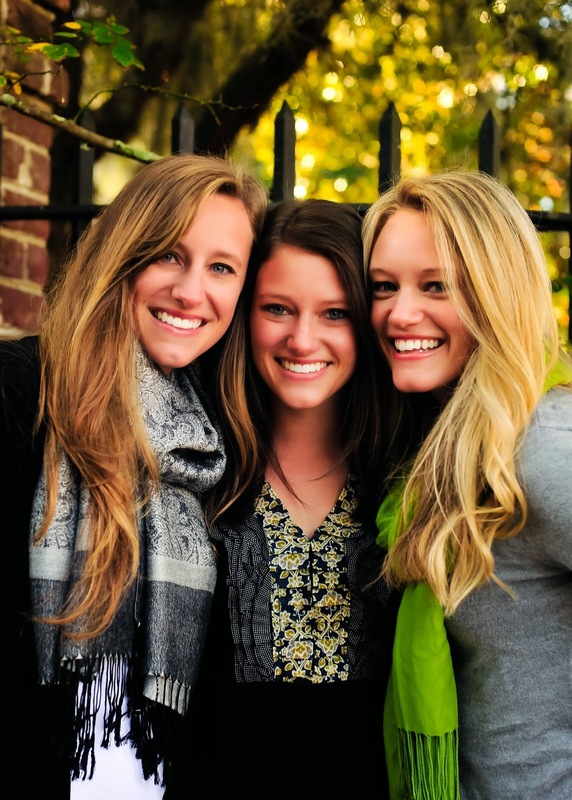 Then in February we announced….SURPRISE! Baby #3 will be here in September. 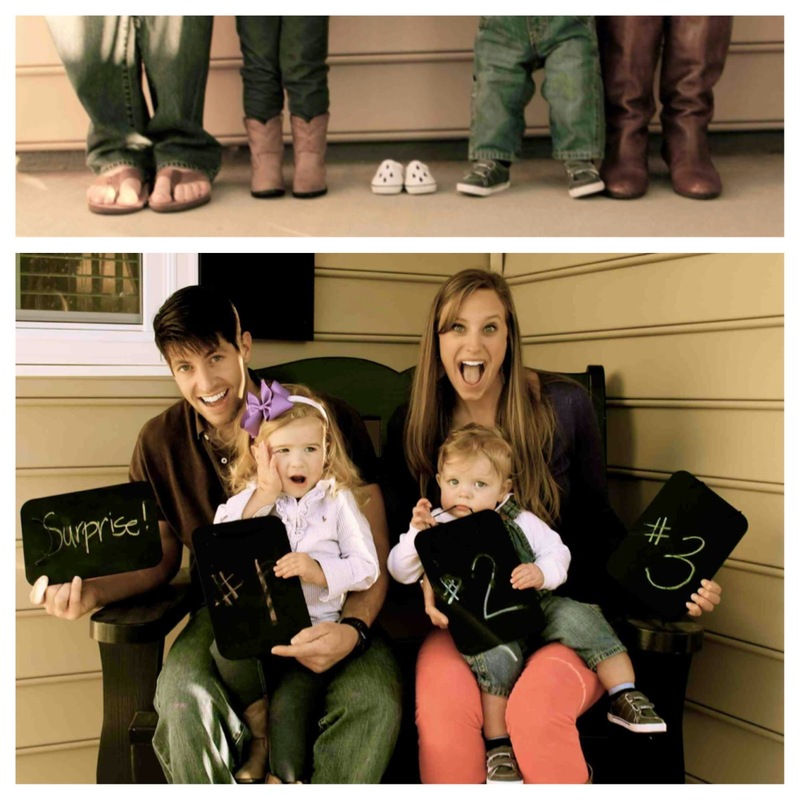 We did not know it would happen this fast, be we are so excited to add another precious baby to our family. At some point in the next 3 months we have to: choose a name, buy a car, and put Cade and Callie in the same bedroom. Now you know why I can not make any promises to be better about blogging! Callie thinks we are going to have a boy and she wants to name him Elsa. She also laughed hysterically when Bryan suggested Noah as a boy name. Clearly we have a long way to go before deciding on a name! 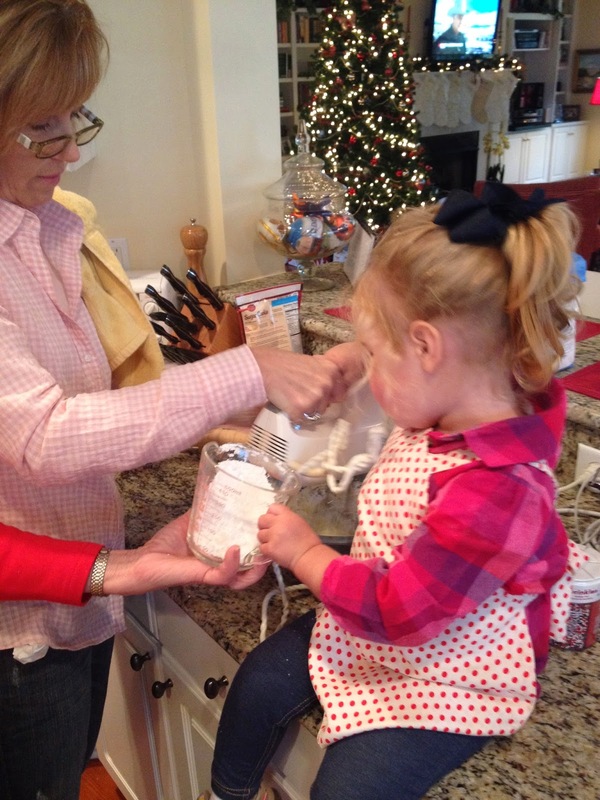 Callie and I continued our Alphabet Baking with some help from Aunt Debbie. The two of them spent hours in the kitchen to make homemade Jelly! We had so many apples, they also made apple pie and applesauce. We still have jars of jelly in the pantry, but the pie and applesauce did not last long! 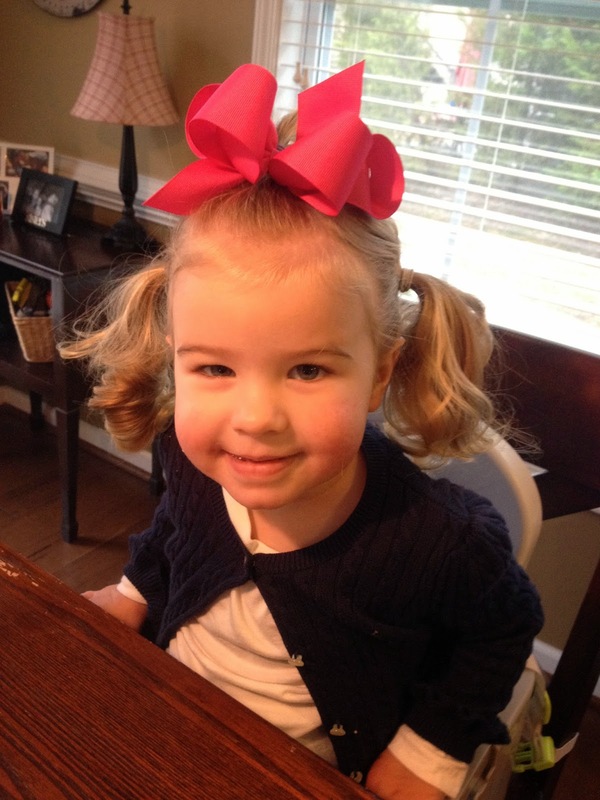 One of the weeks at school was dedicated to Dr. Suess and they had "Crazy Wild Hair Day". Can you believe I sent my child to school looking like this? In the meantime, Cade just kept growing! 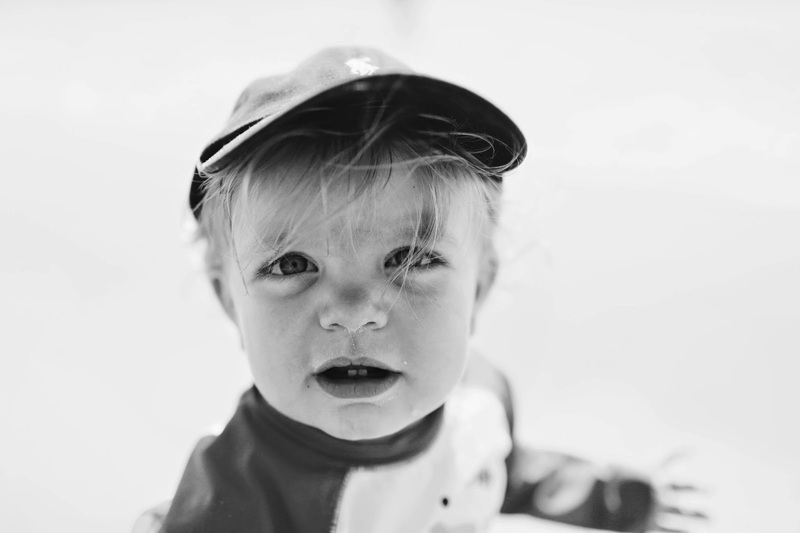 He is quickly catching Callie - people ask me all the time if they are twins. 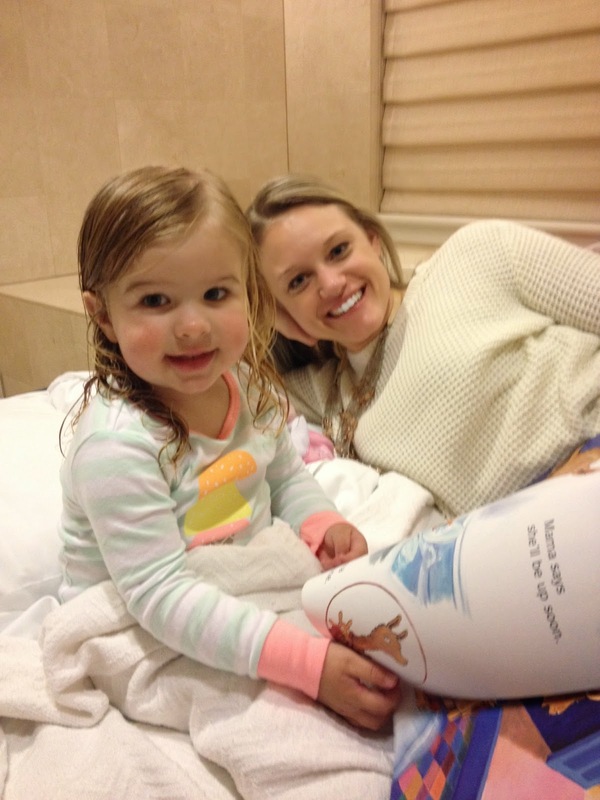 …and a trip to Atlanta to see Aunt LaLa. Thankfully, Cade slept in the car. Isn't that the sweetest face ever? 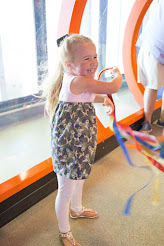 We also had time to visit the Children's Museum in Atlanta while we were there. 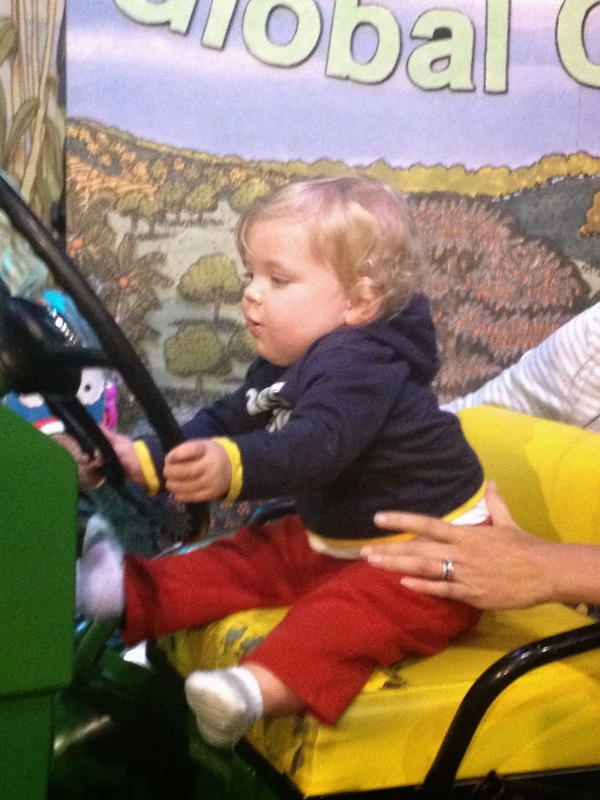 Callie was busy and into everything, and this guy loved to drive the tractor! 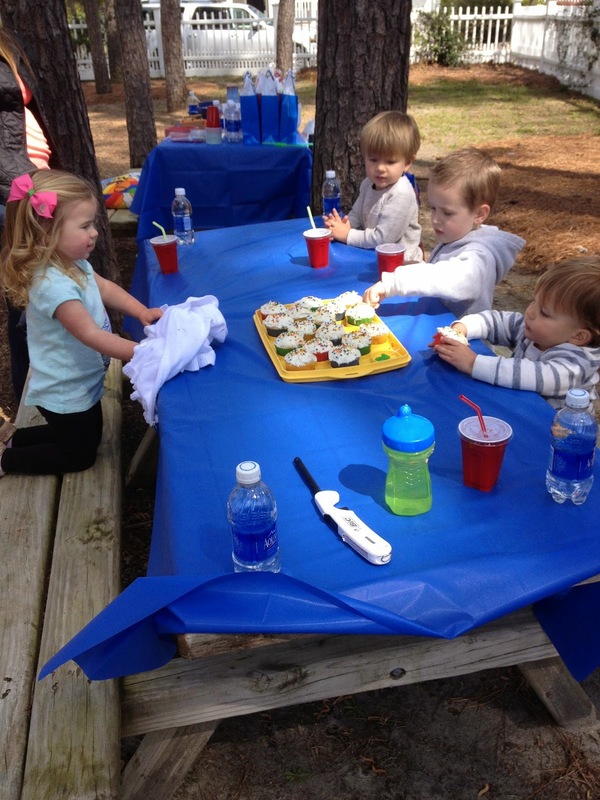 We celebrated Brantley's birthday in the park, and now Callie relates every birthday to cupcakes. 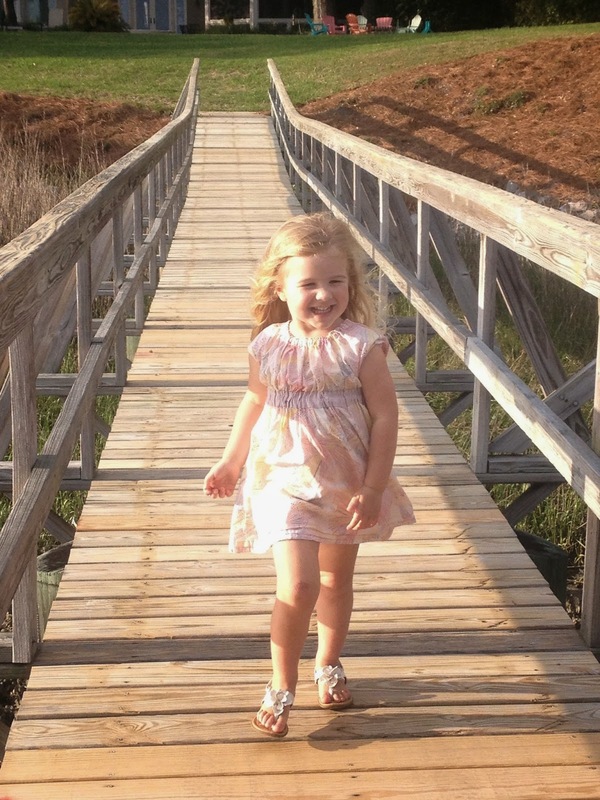 All she wants for her 3rd birthday is to go to the beach and eat cupcakes. I think I can handle that! April brought warm weather and we headed outside. 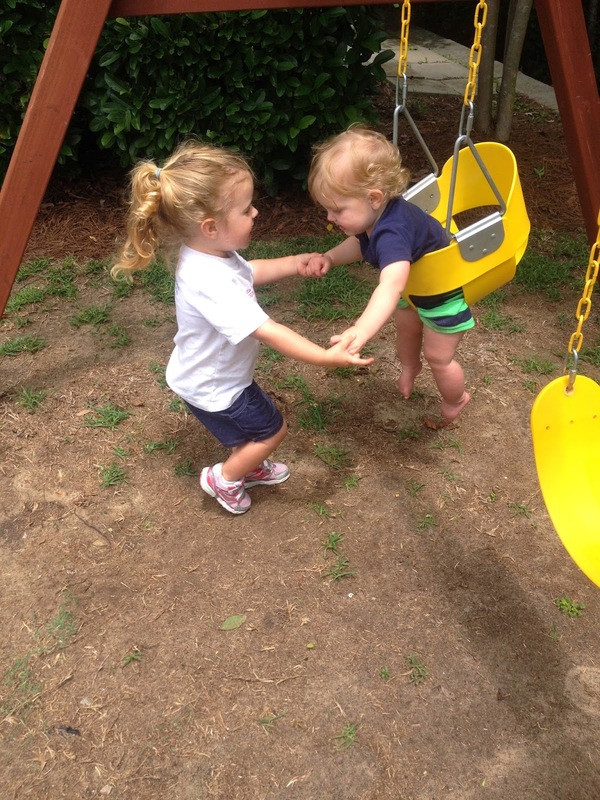 Thankfully my children both still love to swing! We continued our Friday lunch tradition at SCYC with Mama D and PawPaw. 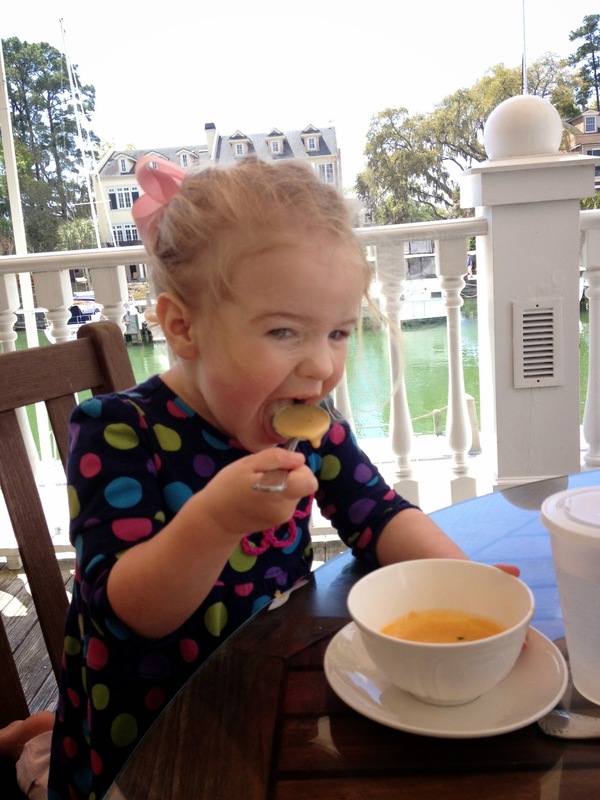 CG loves their she-crab soup and gets excited for it every time we go! 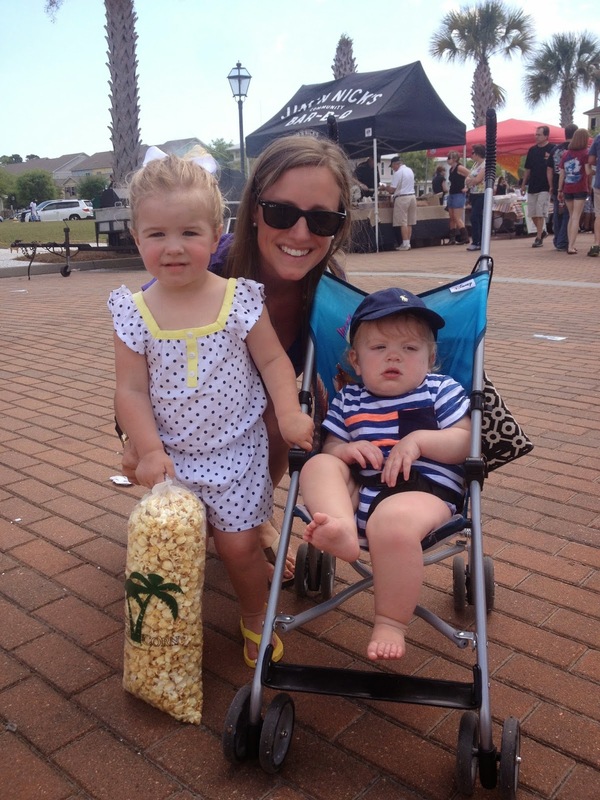 Because I was so tired (being a few months pregnant), I decided that we would go to Taste of Bluffton and just buy Kettle Corn for our "K" alphabet baking. I know that is cheating because we didn't cook anything, but it was so delicious! I decided to try to be somewhat creative this year, and we actually dyed eggs for Easter! Yes, all I did was buy a kit from Target and add water, but the kids had fun! 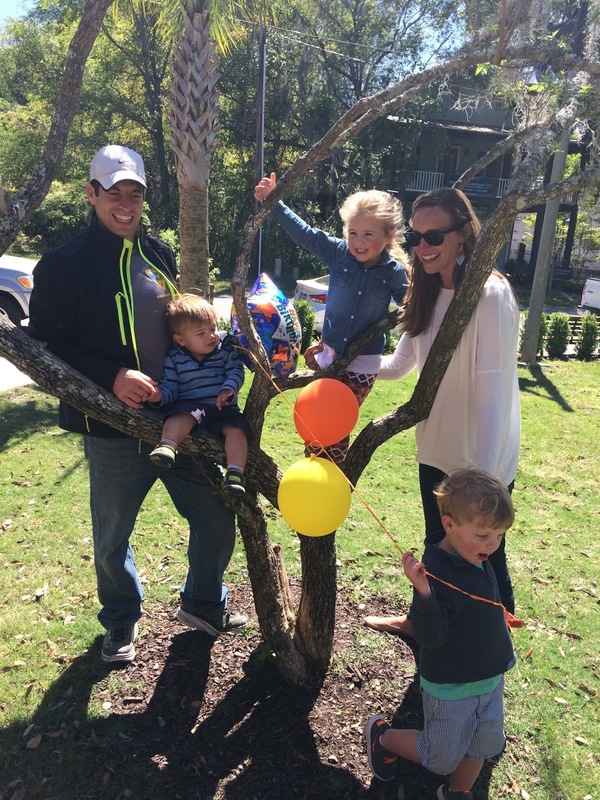 The whole family came to Bluffton to celebrate Easter weekend and Cade's birthday. 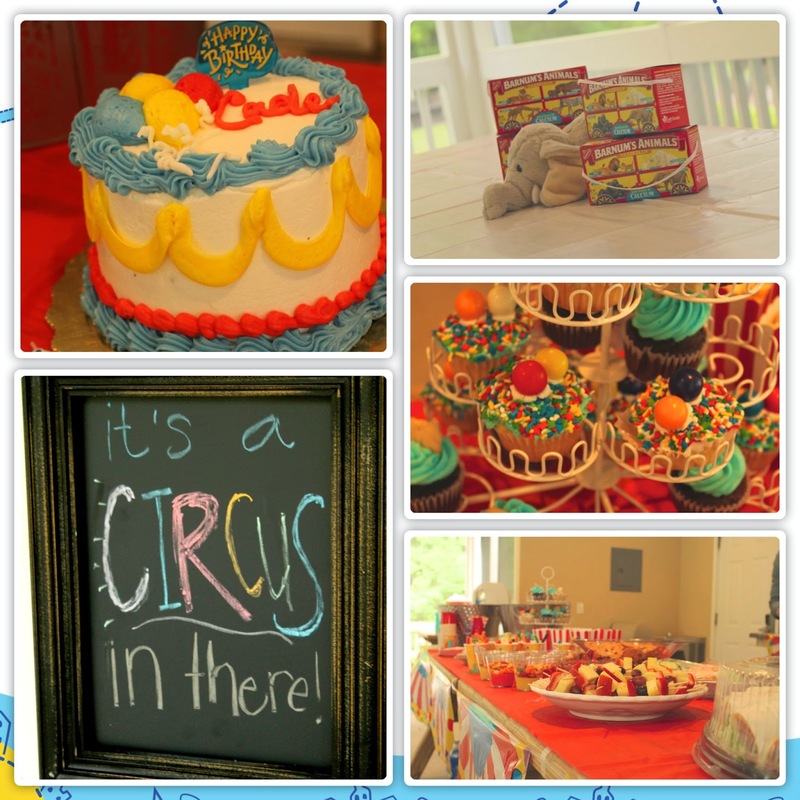 For Cade's party, we went all out with a circus theme, thanks to help from Aunt LaLa, Auntie Em, and Mama D! Everything looked so cute and I think Cade had a great time! Emi created a cute little "photo-op area" and we actually took a family picture. Will we ever take a picture when all of us are looking at the same camera? 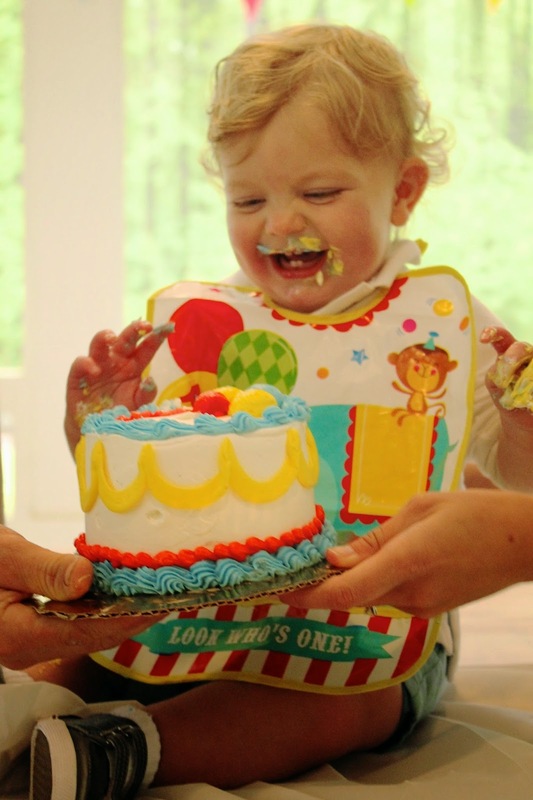 Cade absolutely loved his birthday cake..
…and didn't want to stop eating! Of course, this much sugar for the first time meant he spit it all up a few minutes later. We had bubbles at the party, so that kept Callie very entertained. They both are enjoying the many new toys that Cade got as presents. This tent has been in my living for almost 2 months now! We made our first (of many) trip to the beach in April! Cade is absolutely obsesses with his shovel and will not set it down. Callie can and does take every other toy from him and he never makes a noise, but she knows not to try to touch his shovel! I am so glad that they both love going to the beach. It is a lot to load up to get there, but once we are there it is totally worth it! 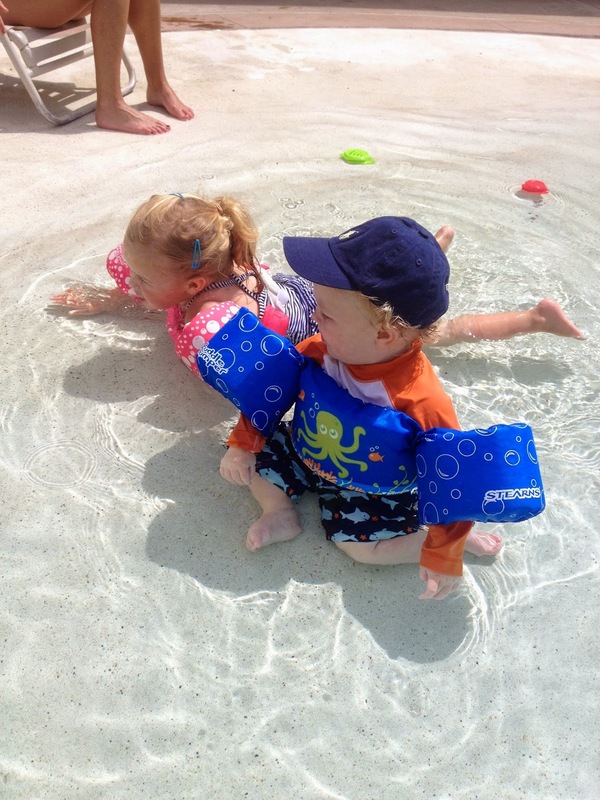 They both love the water and have absolutely no fear. 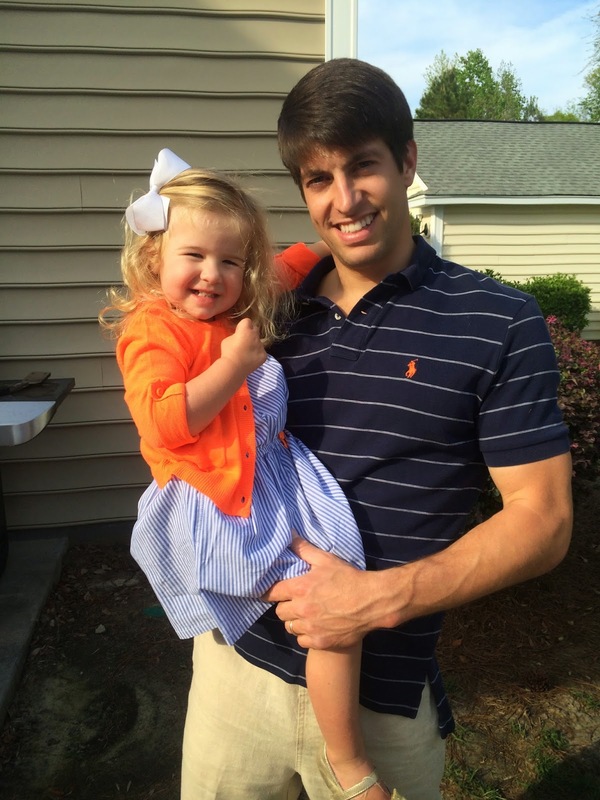 Callie loves when Daddy comes with us because she gets to "go out more!" I will not get in and swim with her so she can only stay where she can touch when I am there. They also love to build castles (that are actually giant holes) and play in the sand. It is always an adventure but we love it! 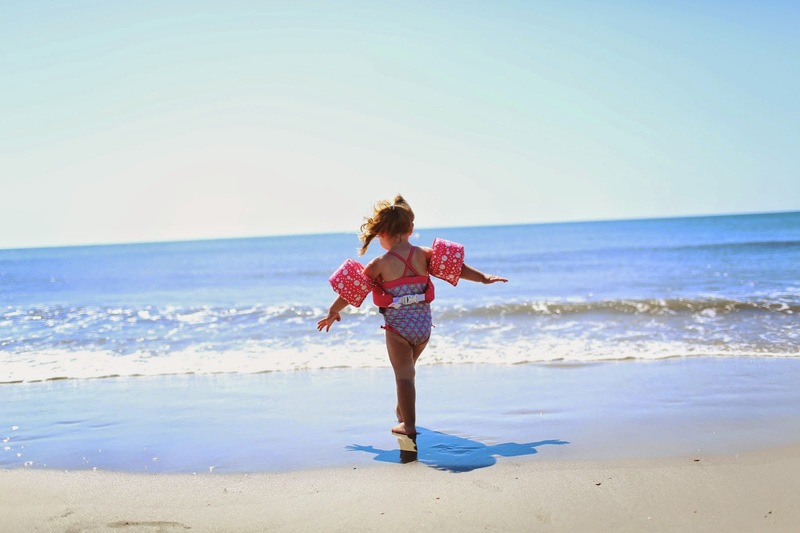 We have take a few Sunday night trips to the beach. I love the beach that time of day! We went to Clemson for Devin's graduation (Way to go Dude!) and the Clemson Triathlon. Bryan didn't get to race, but Cade and Callie had a great time cheering on everyone else! We drove home from Clemson, let the kids nap, and headed straight to the beach. It was a great night - the beach with my family and pizza once we got home. Who could ask for more? When we are not trekking out to the beach, we head to the pool. 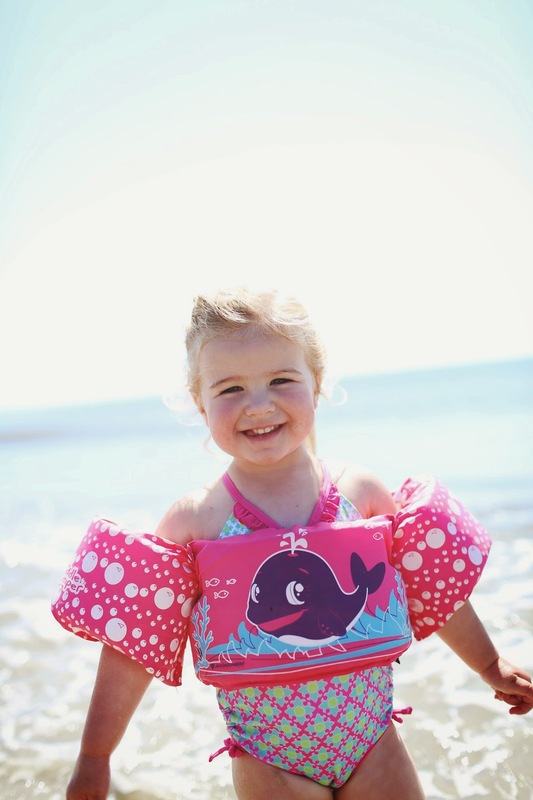 Callie is getting very comfortable in the water and I cannot wait for her to take swim lessons! 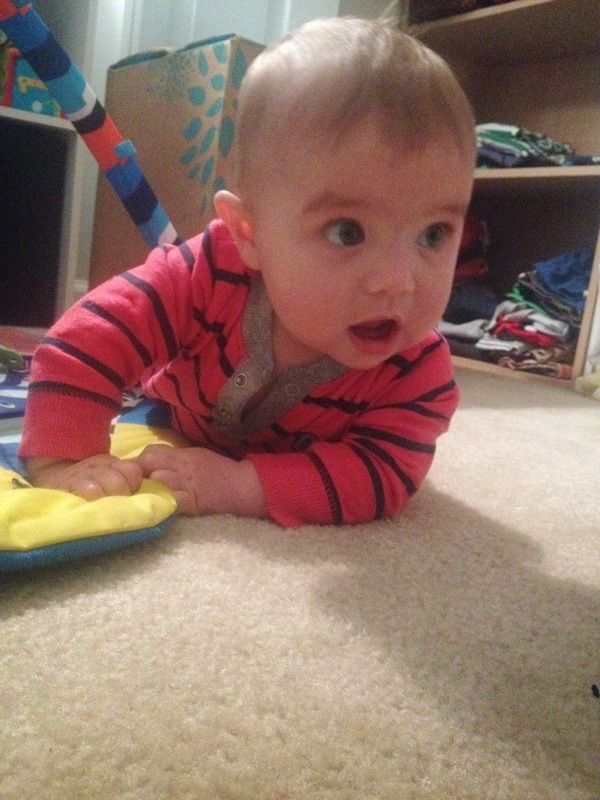 Cade also has no fear and just keeps crawling until I turn him around. 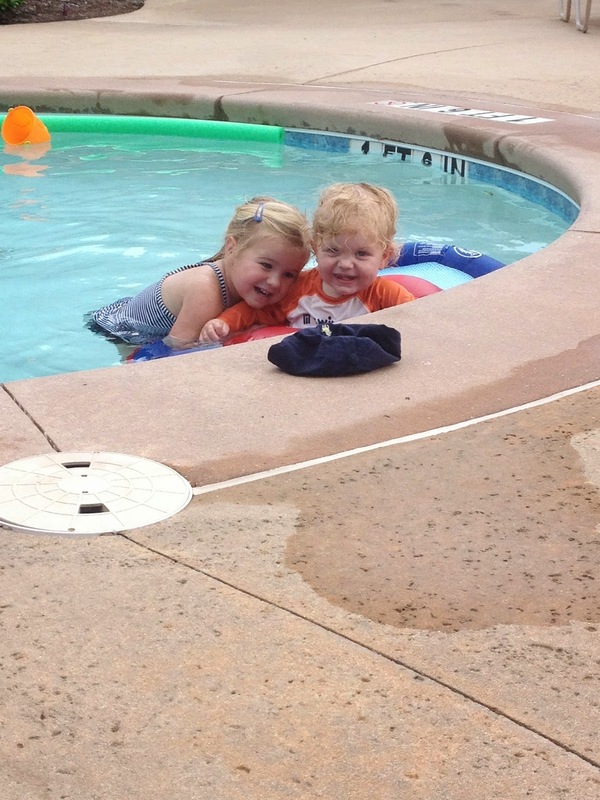 Cade also loves the baby pool where he can walk in his float. I think he enjoys the freedom of being able to go where he wants to go! It may be a few more months before he is actually walking though. Auntie Em has been able to come home a few times and spend some quality time with the kiddos. One hot afternoon we made Cherry Limeades ("L" is for limeade). Callie made a great face the first time she tasted it! I think the carbonation got her and it was hilarious. PawPaw ordered and installed a swing on their deck so that my two swing-loving children would be able to swing at their house. It has only been up a short time and they have enjoyed it many times already! 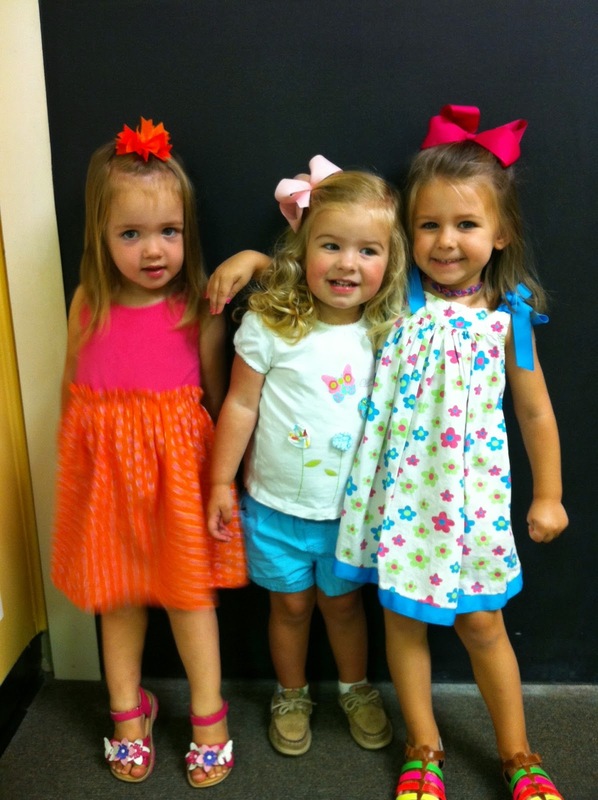 A Year of Preschool Complete Already?! They did an end-of-year program, and Cade was very into the music! It was definitely a day for celebrating! 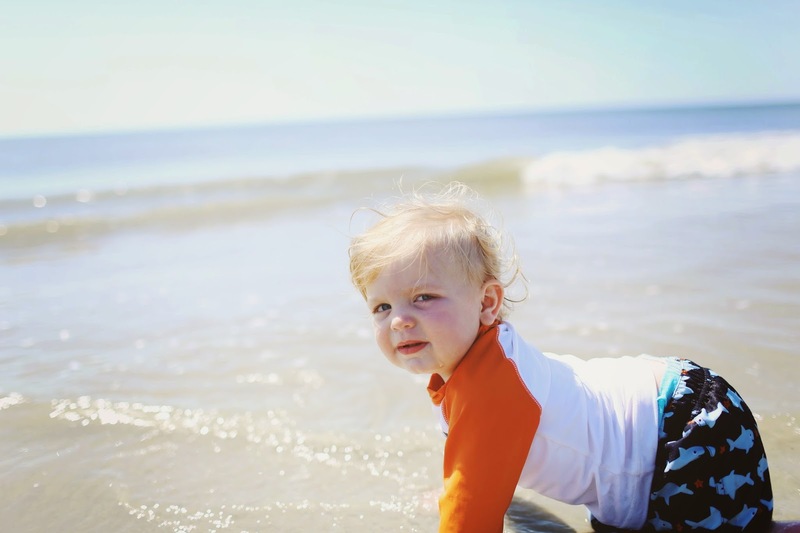 During one of our many trips to the beach, Carrie Friesen got some great pictures of sweet kiddos. 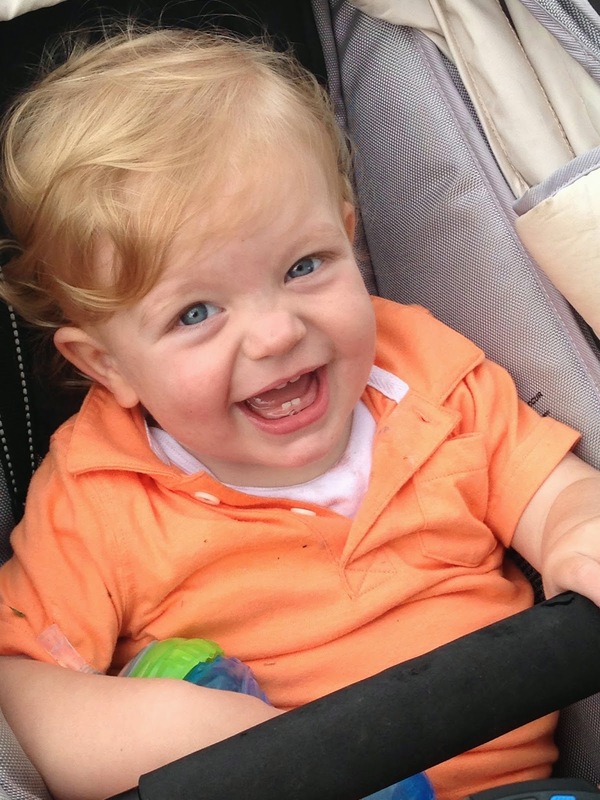 Can you believe this little man is already 1? 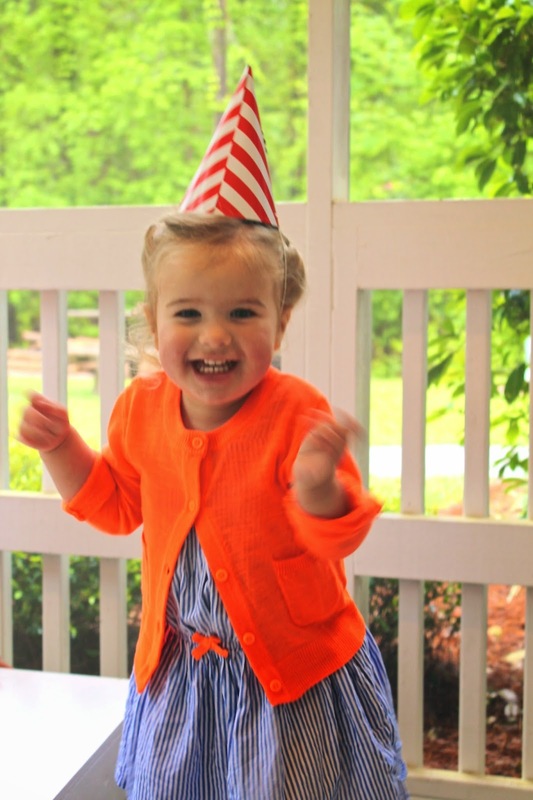 And that Callie is almost 3? So there is the longest blog post ever, but hopefully you feel caught up! Until next time!